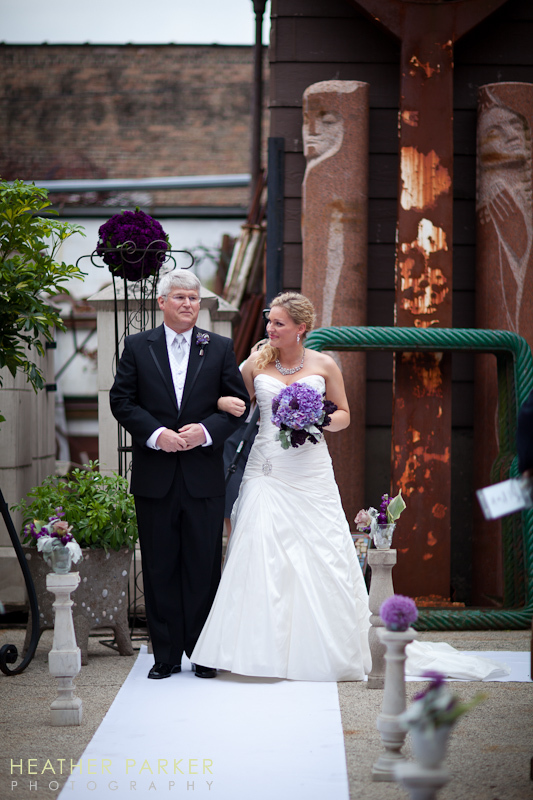 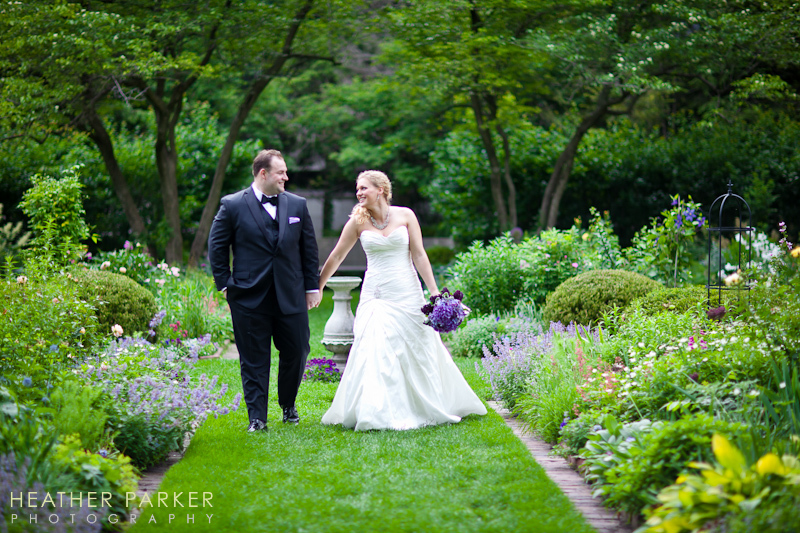 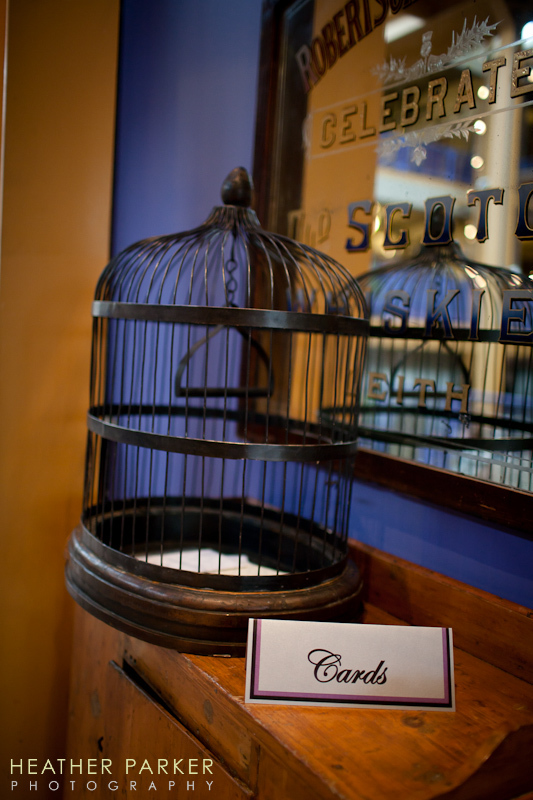 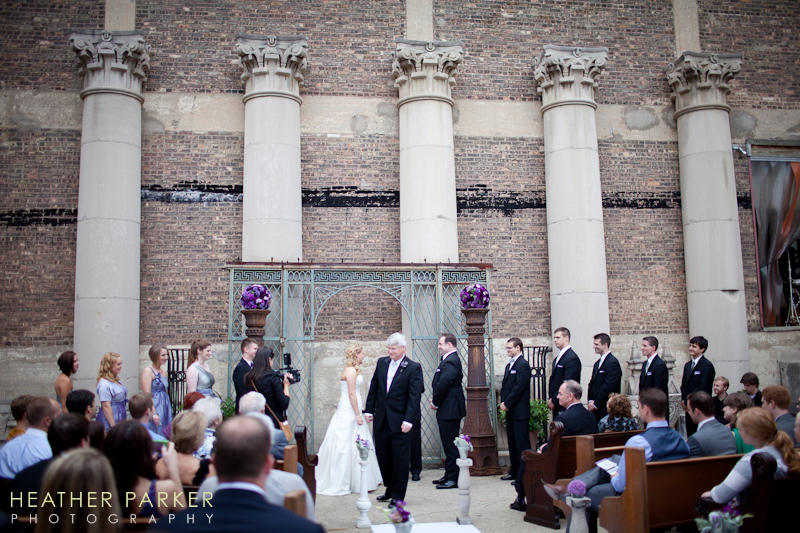 Architectural Artifacts was the ceremony and reception venue that Julia and Tanner chose for their Chicago wedding. 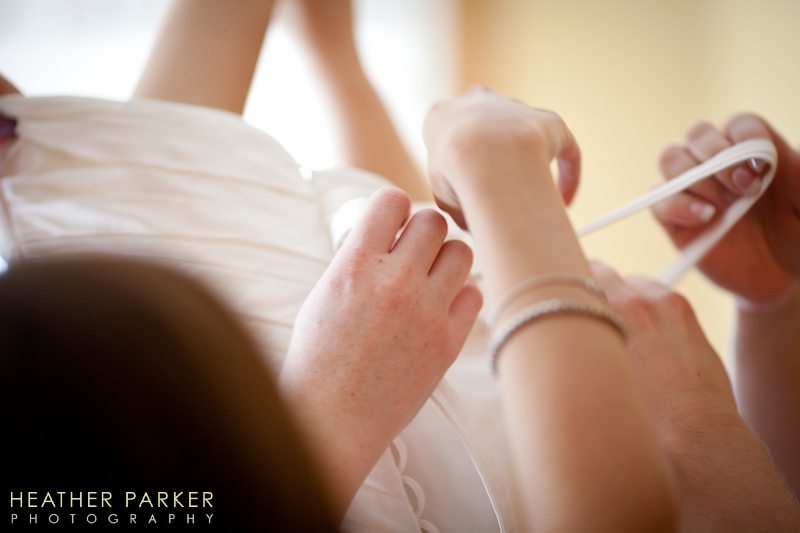 Julia and her mother Beverly flew in from Oregon to discuss their wedding photography with me. 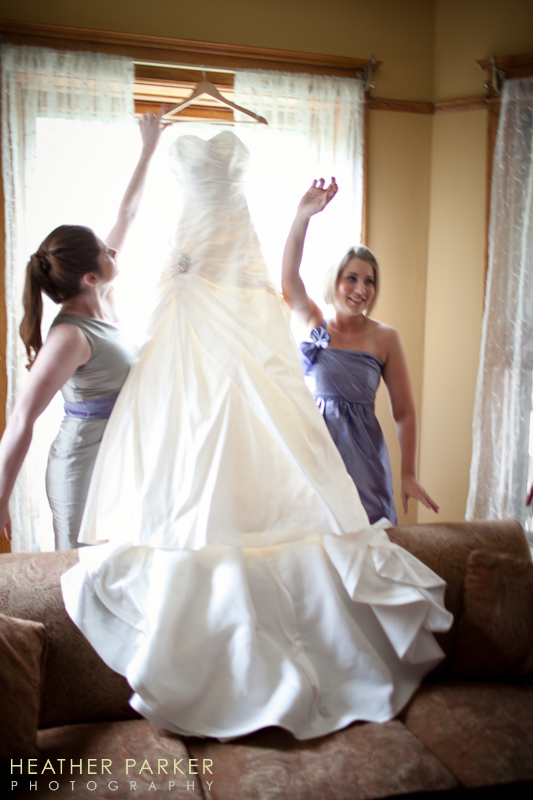 Beverly helped Julia plan one of the coolest weddings ever. 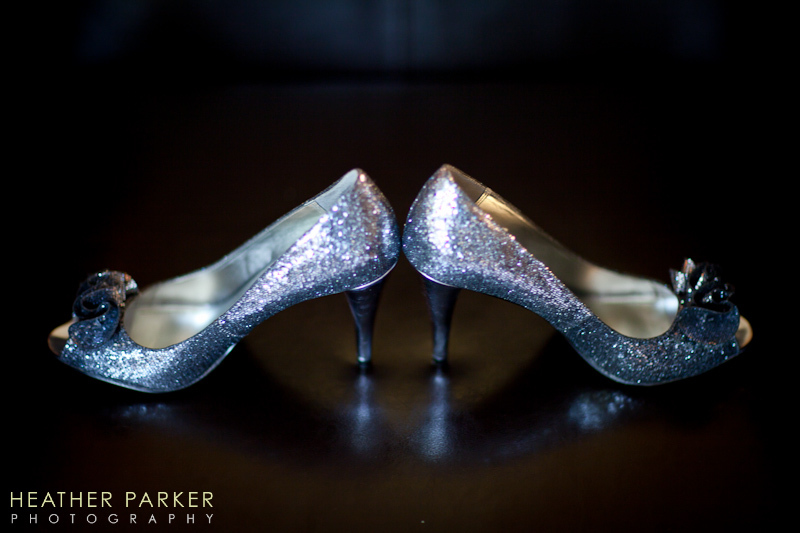 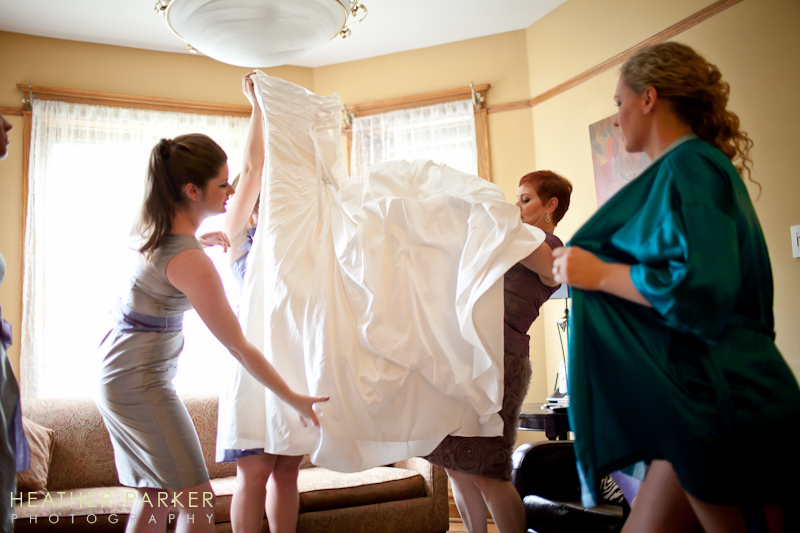 I arrived to photograph Julia and her bridesmaids getting ready at the Chicago Guest House. 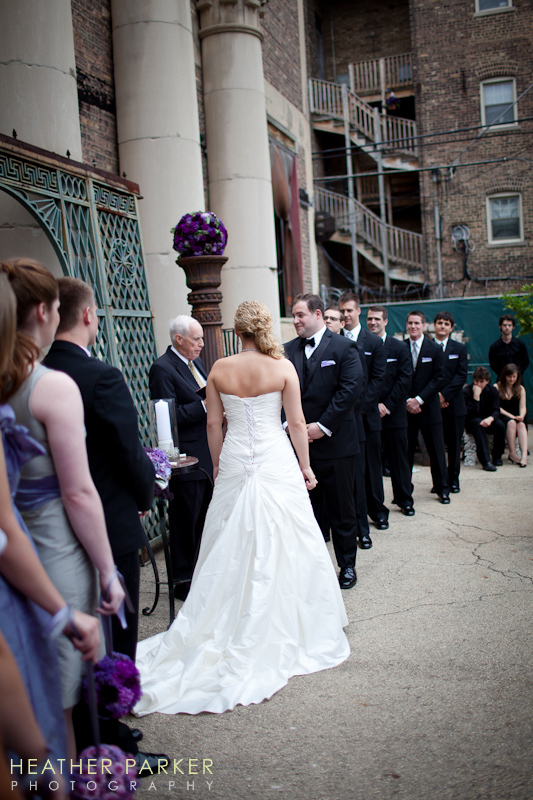 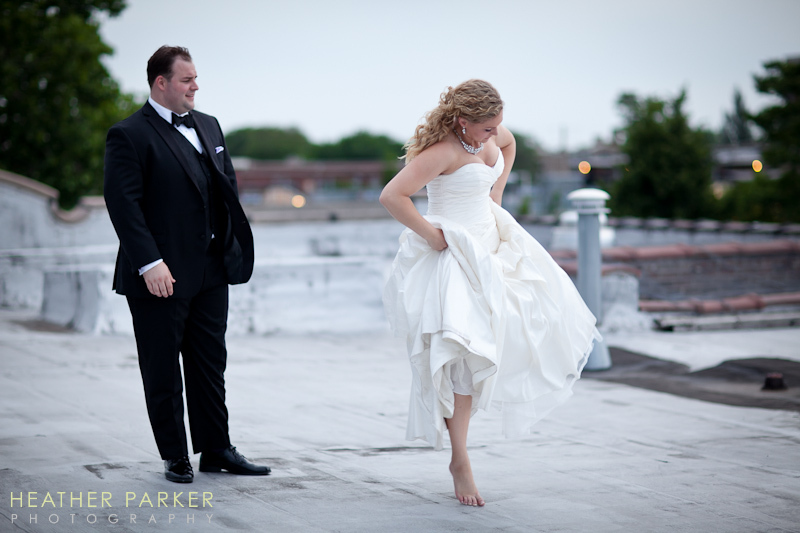 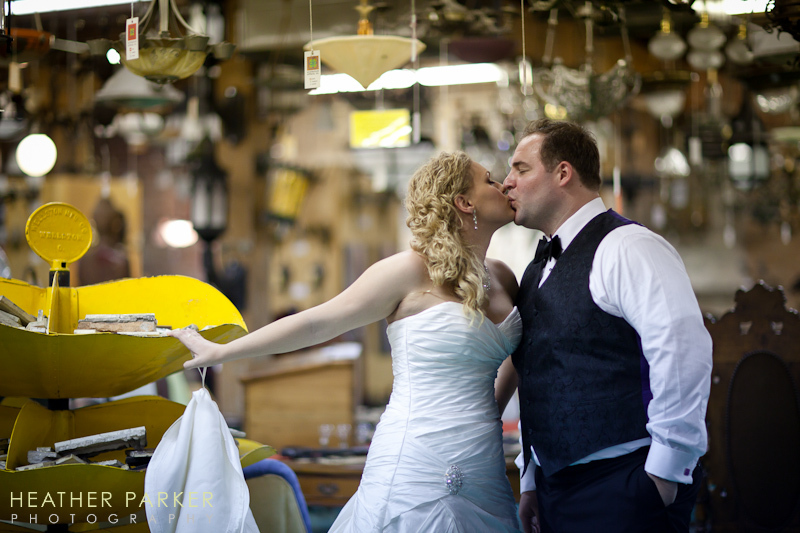 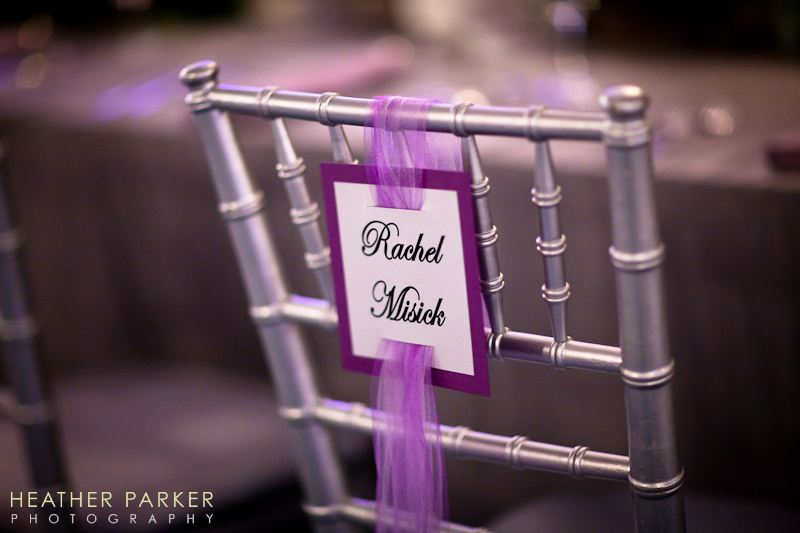 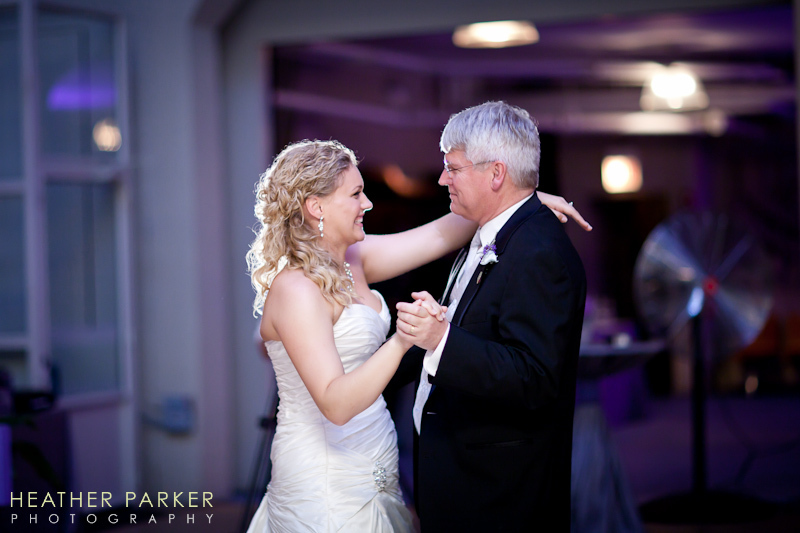 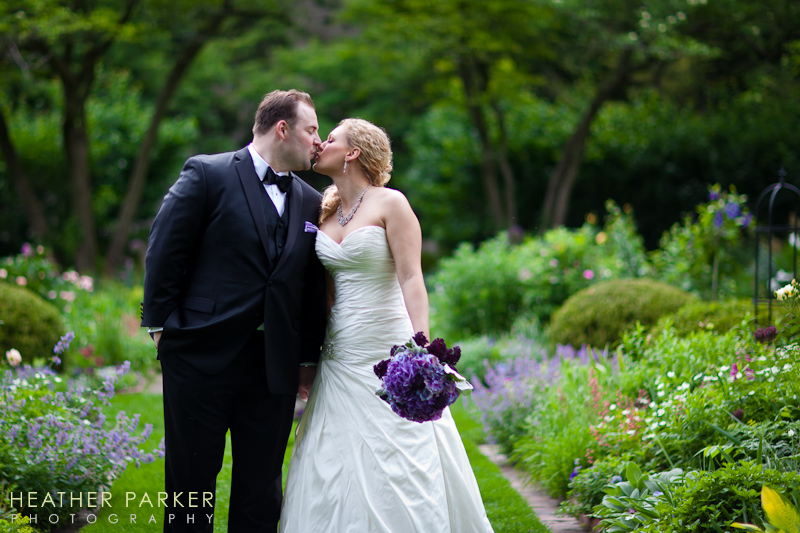 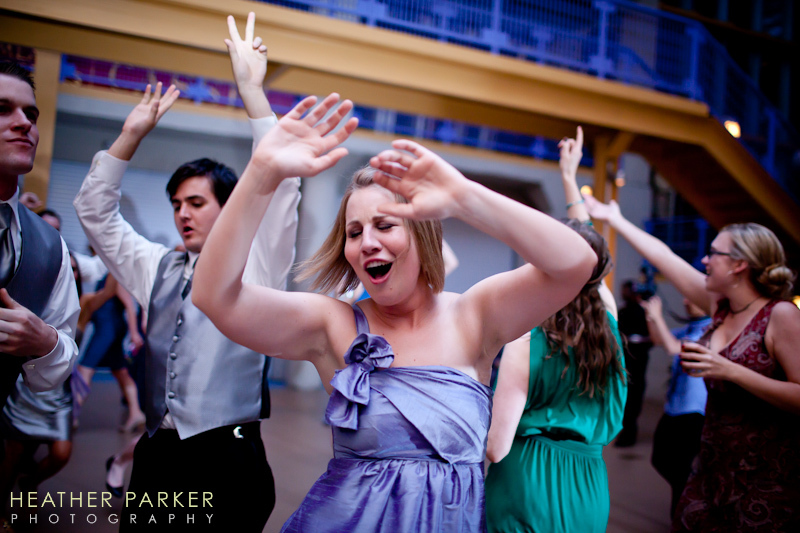 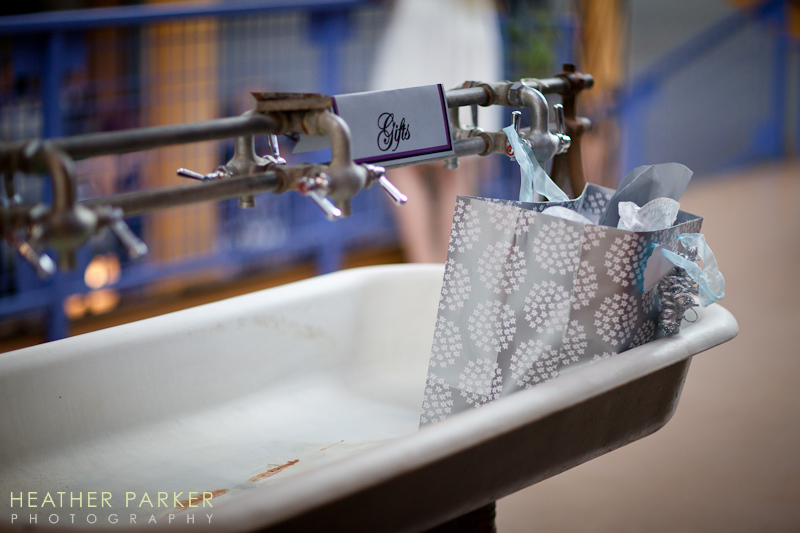 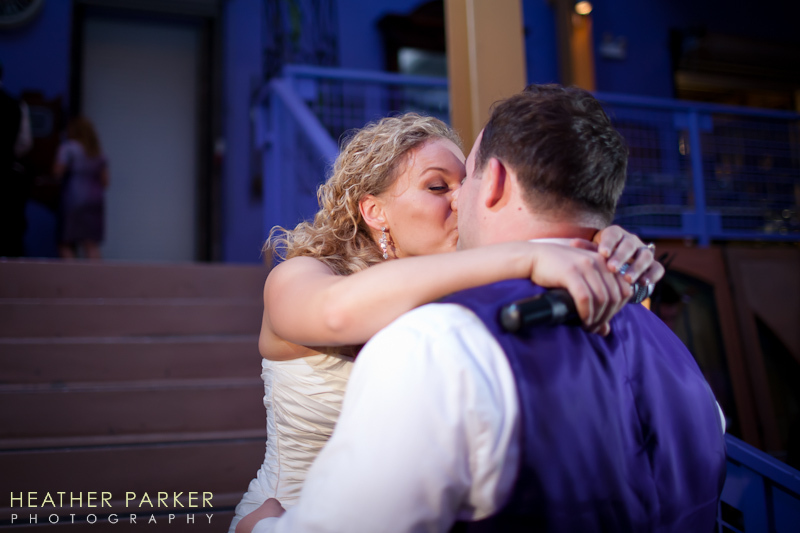 Since Chicago was the location for their destination wedding and neither of their families resided in the area, they had the entire rowhouse to themselves and it was the most perfect location for getting ready. 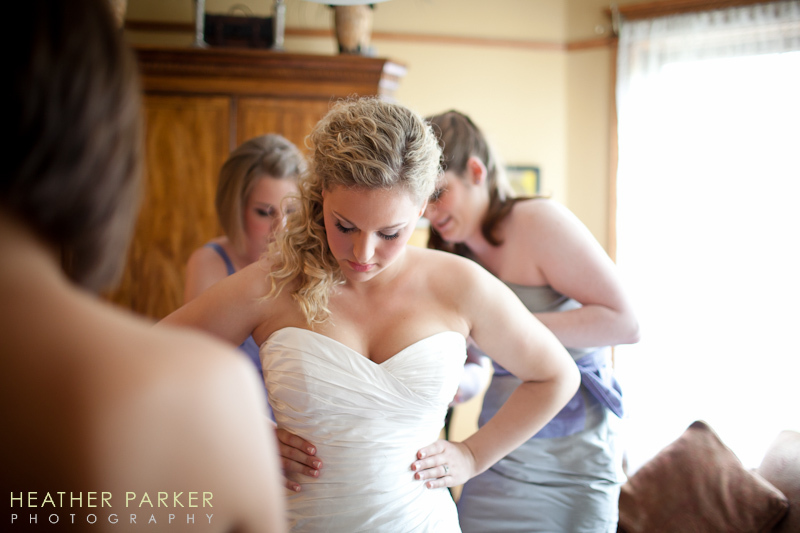 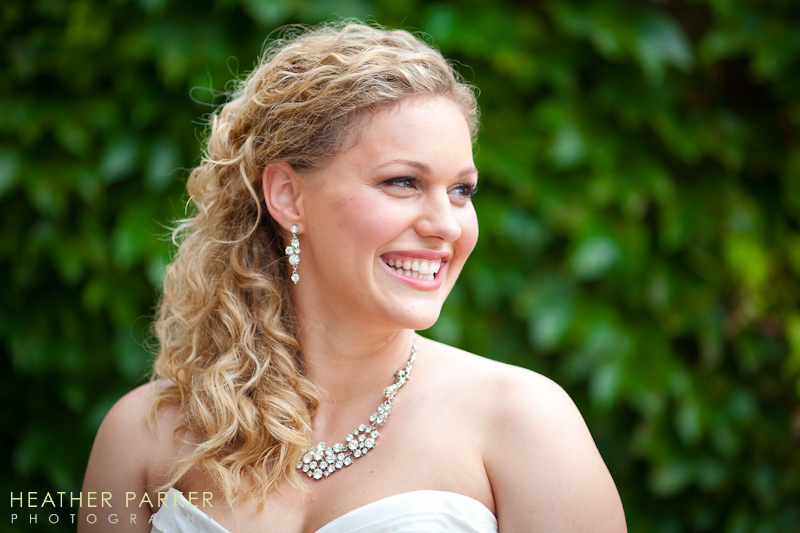 The bride enlisted the girls from Sonia Roselli to work their magic on the lovely ladies. 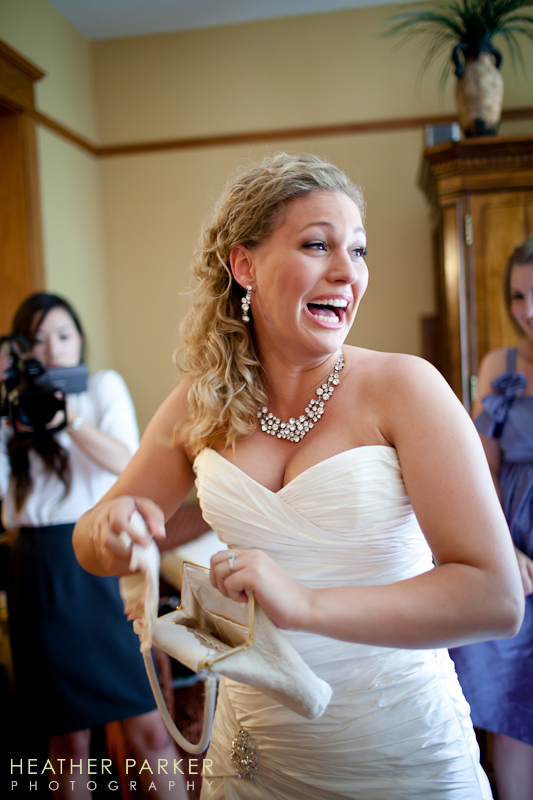 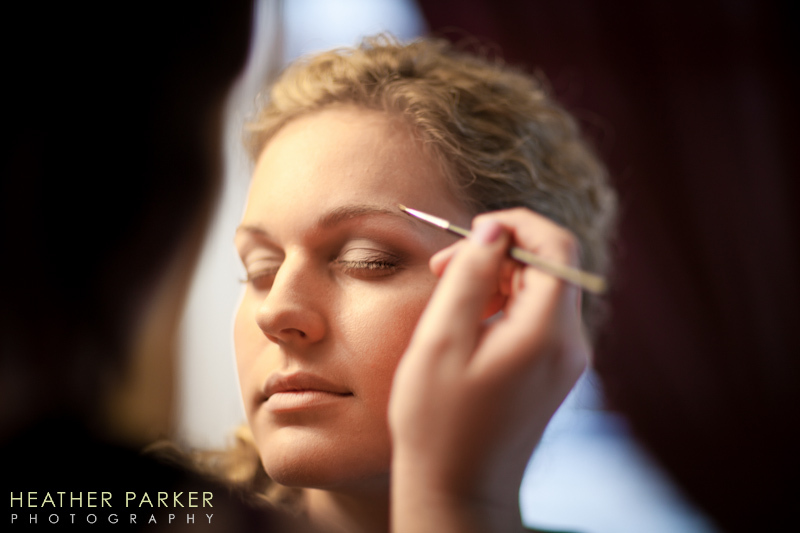 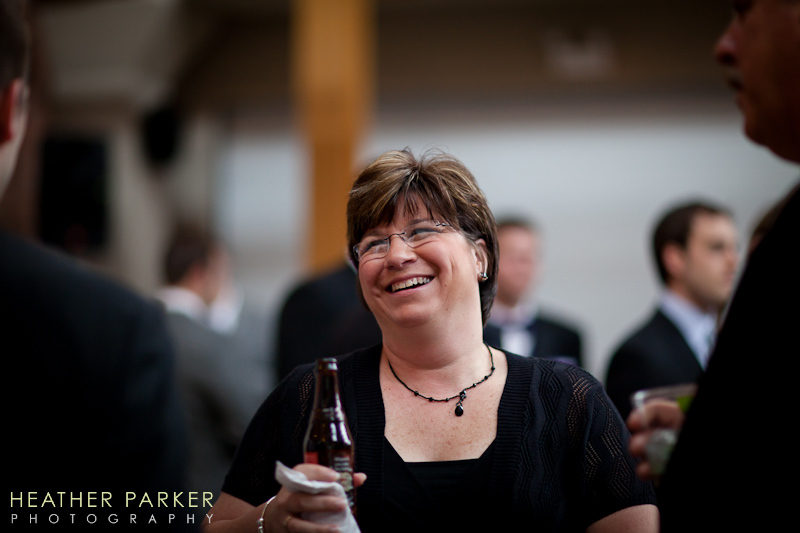 These photos show how important it is to allow a full hour of getting ready photography on a wedding day because they are filled with emotion and laughter. 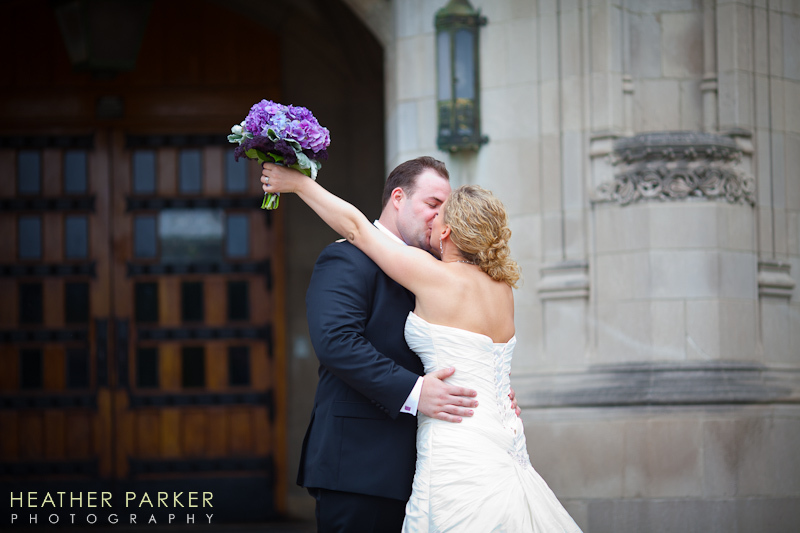 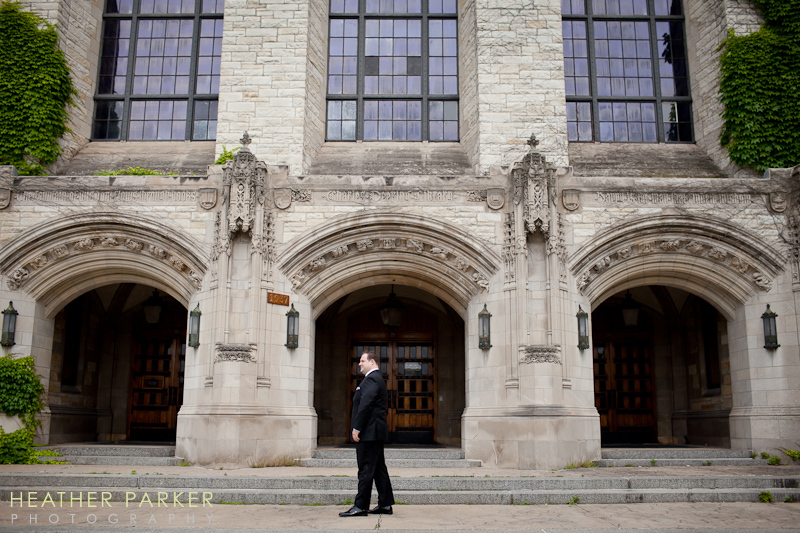 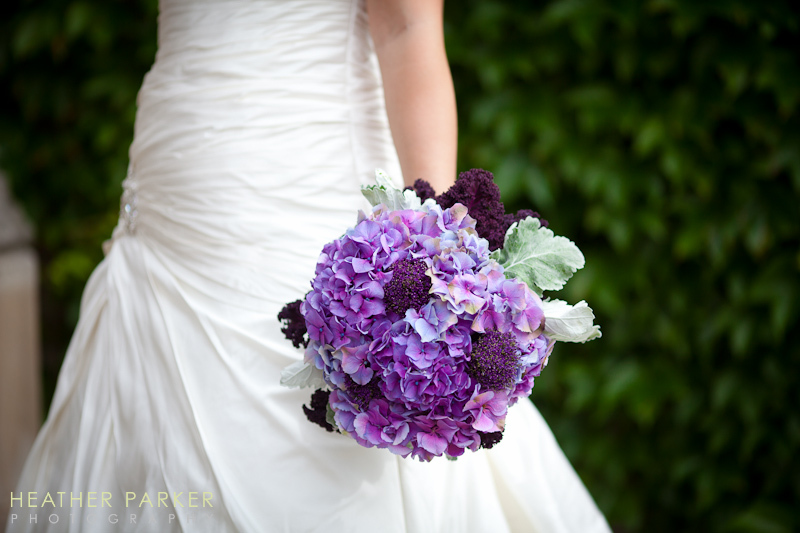 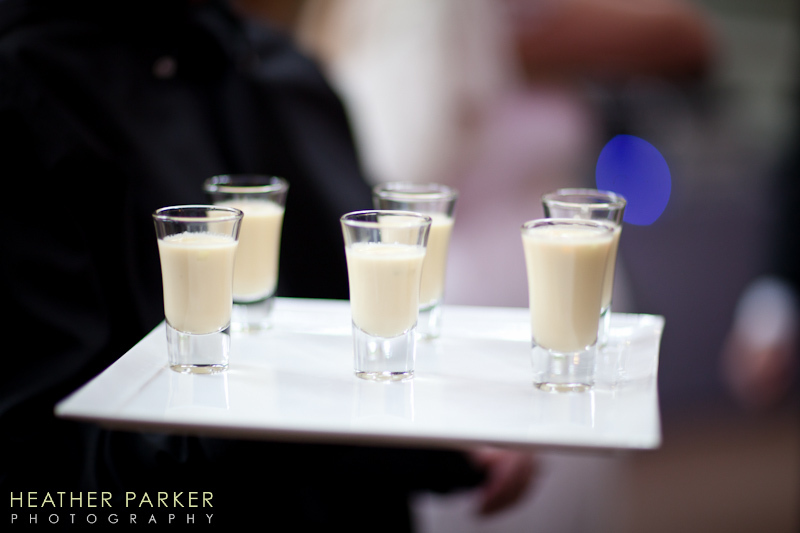 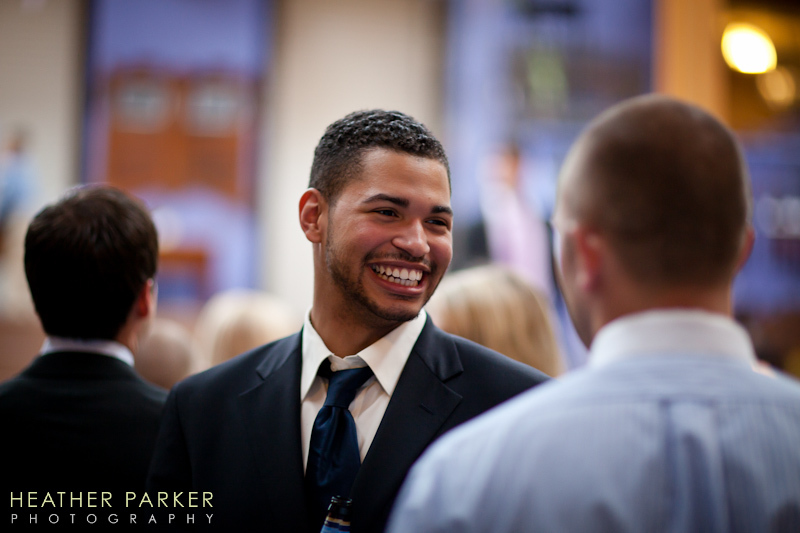 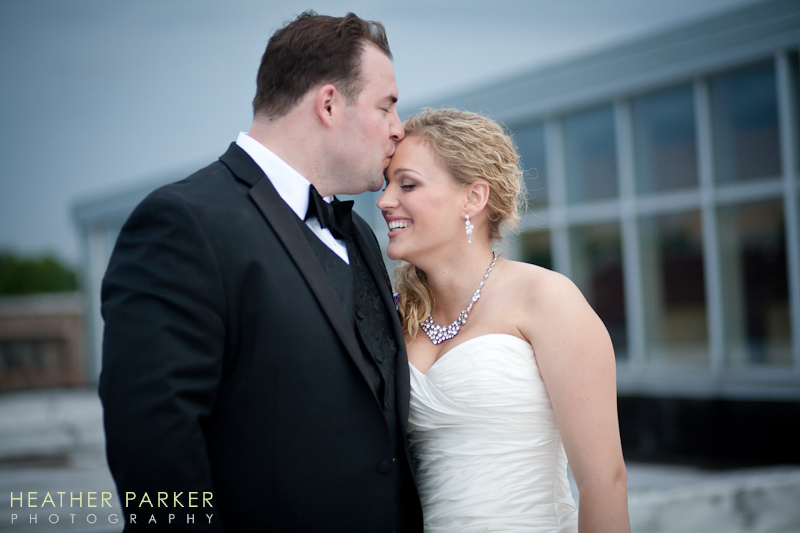 We headed out with the ladies bring the bride to her first look with the groom at Northwestern University. 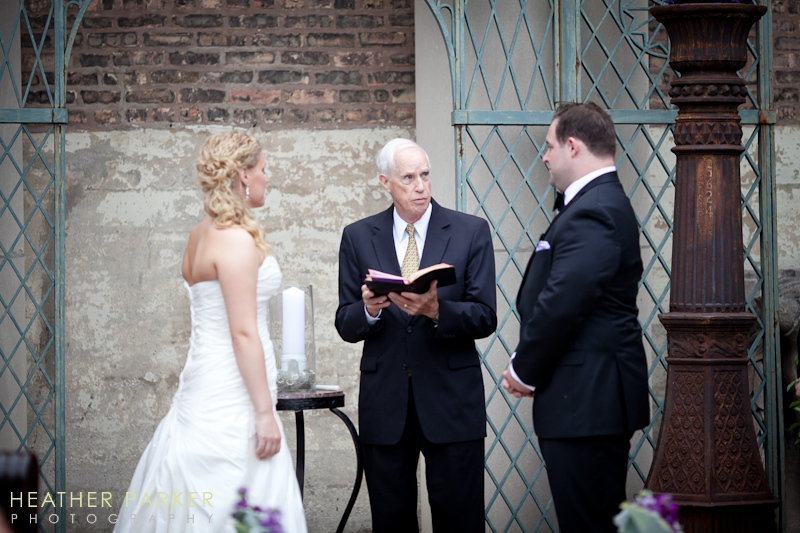 Julia’s brother joined us since he was the Man of Honor. 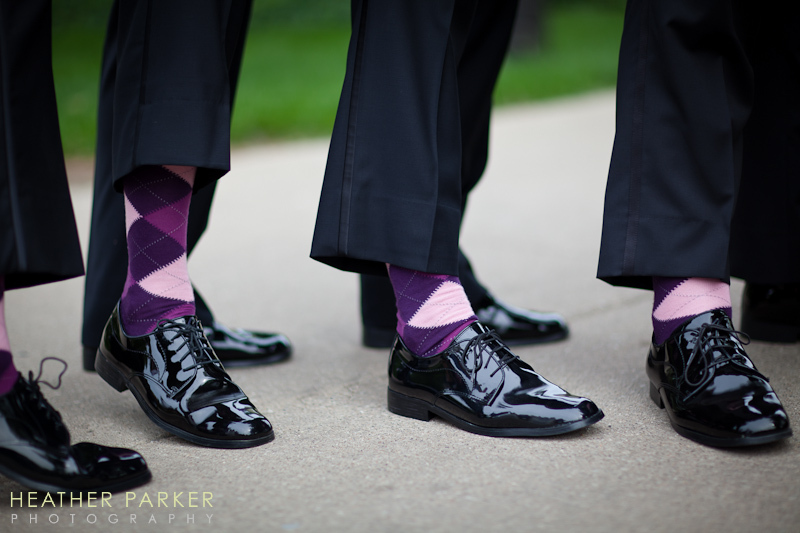 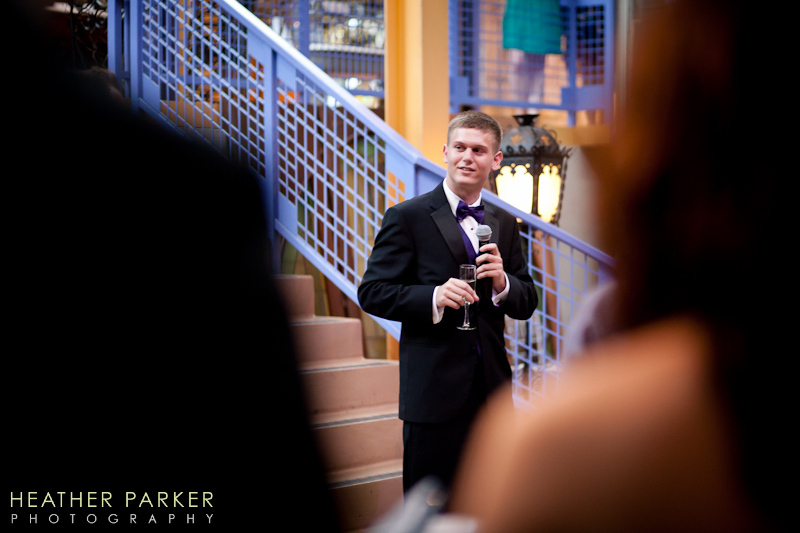 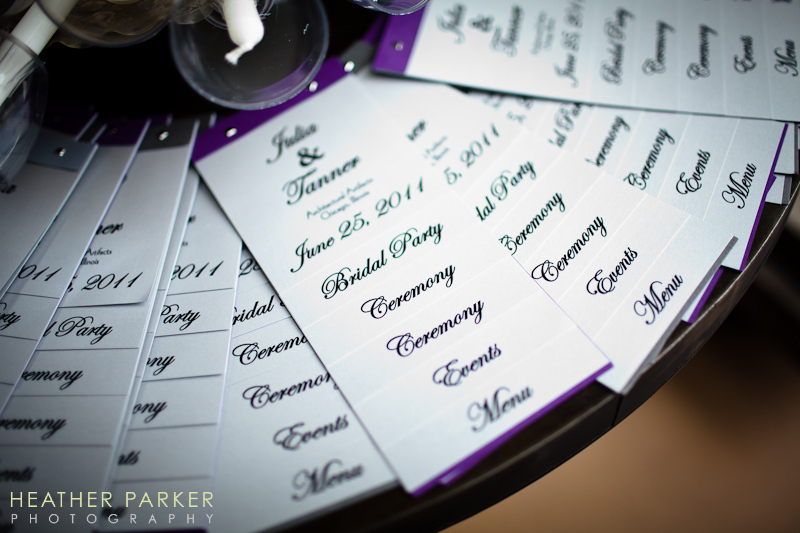 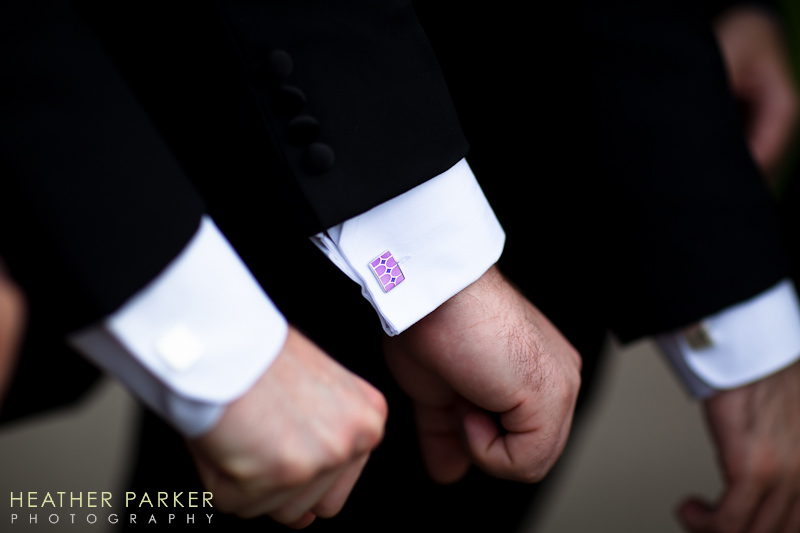 To compliment the purple and silver colors throughout the wedding day, the groomsmen wore purple cufflinks, argyle socks, as well as silver ties and vests. 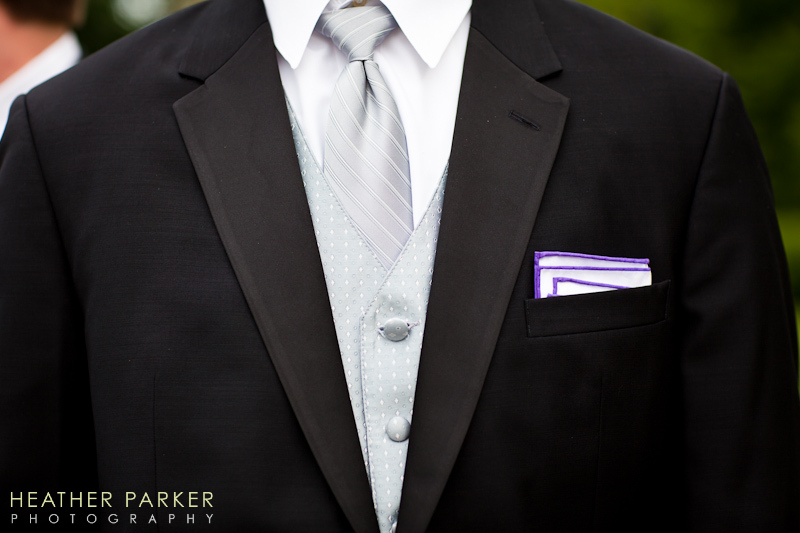 Their pocket folds even had purple edging. 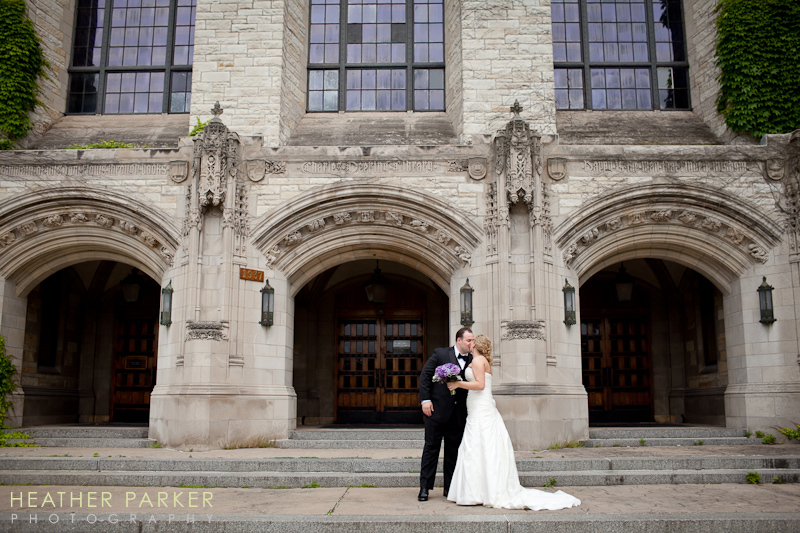 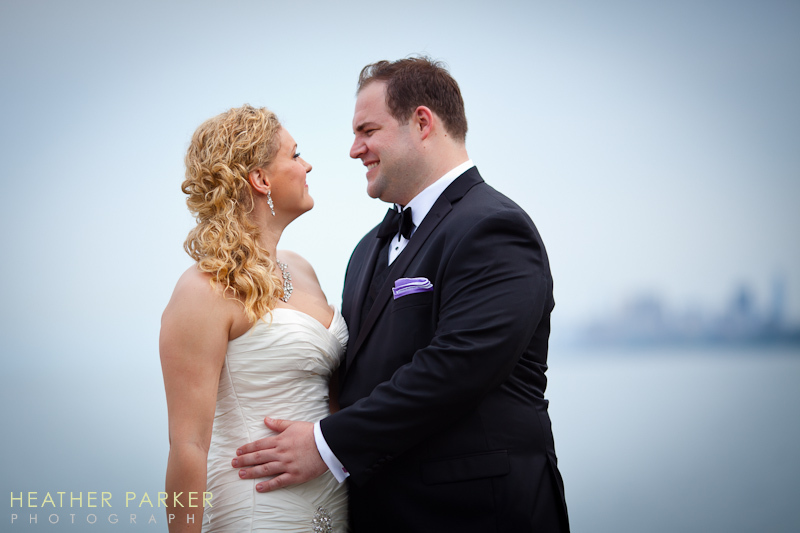 We headed to Northwestern, the university where the couple met and fell in love. 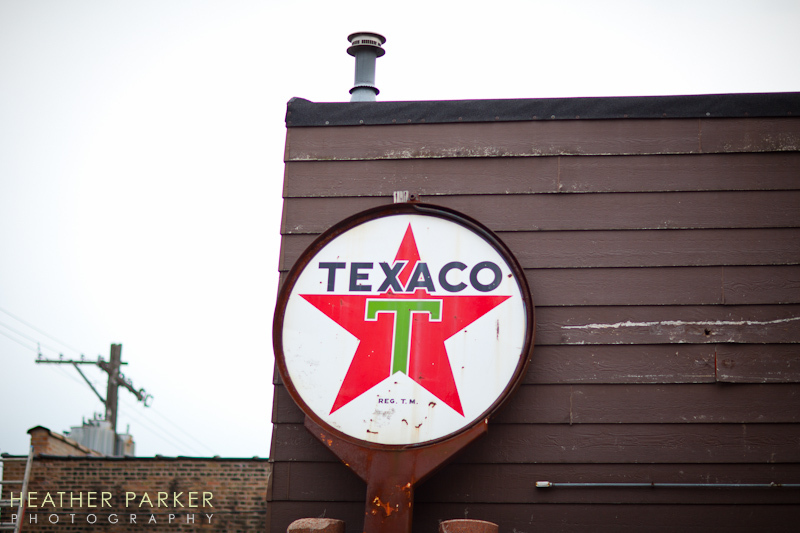 We headed over to where Tanner was waiting for Julia. 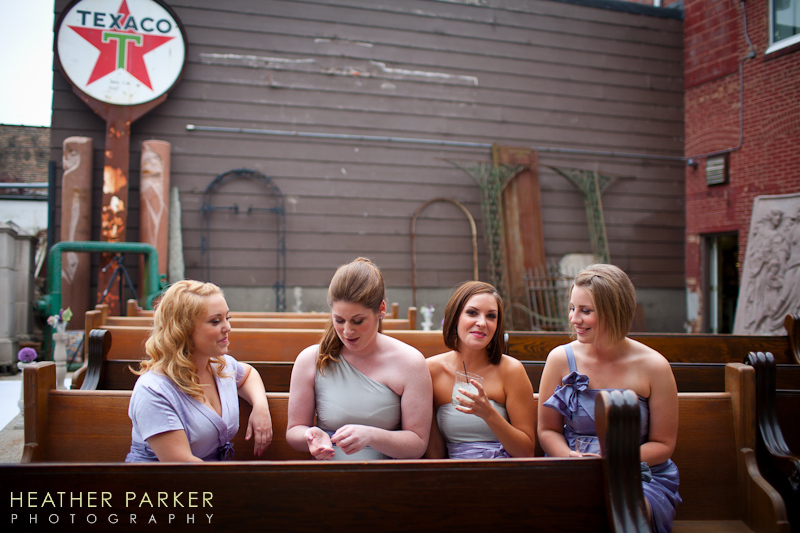 Look at how pretty her bridesmaids were. 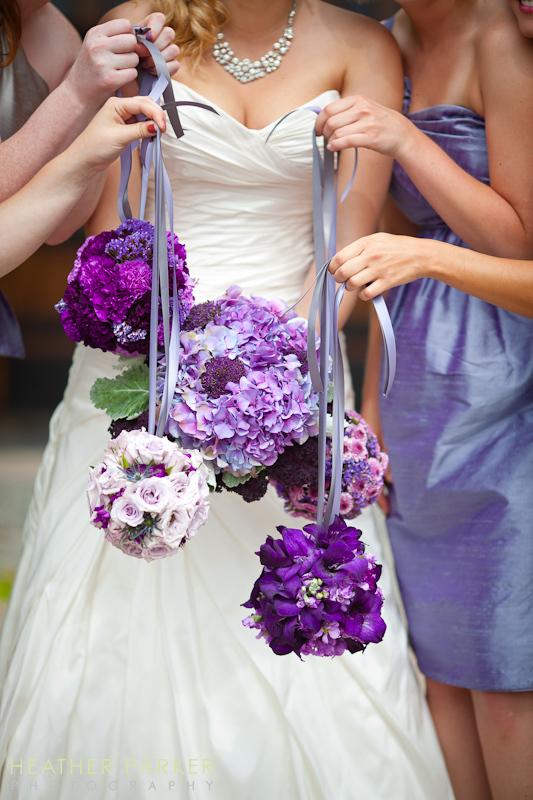 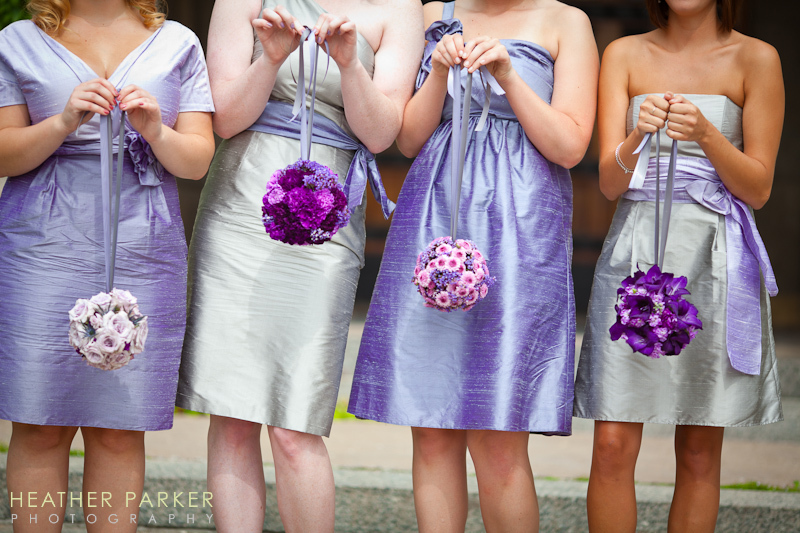 I adore the alternating colored Siri bridesmaid dresses. 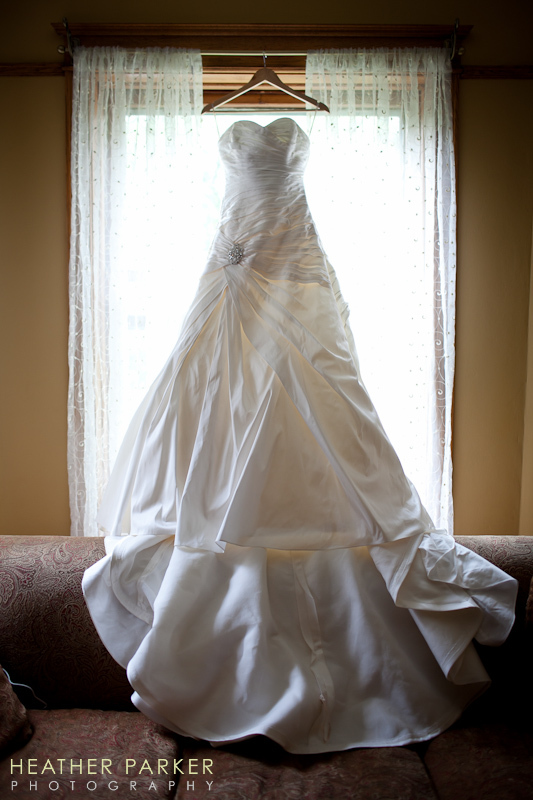 The Siri dress came way before the iPhone app! 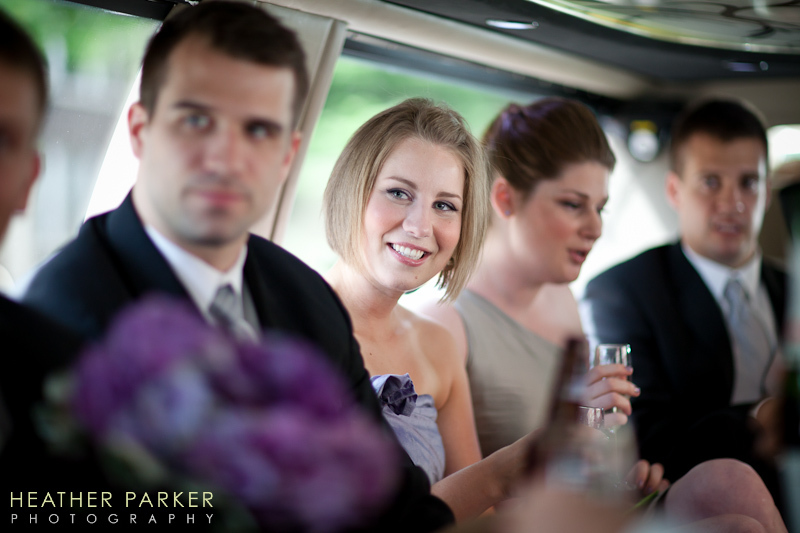 After some photography at Northwestern, we got in the limo and headed back to Architectural Artifacts for cocktail hour! 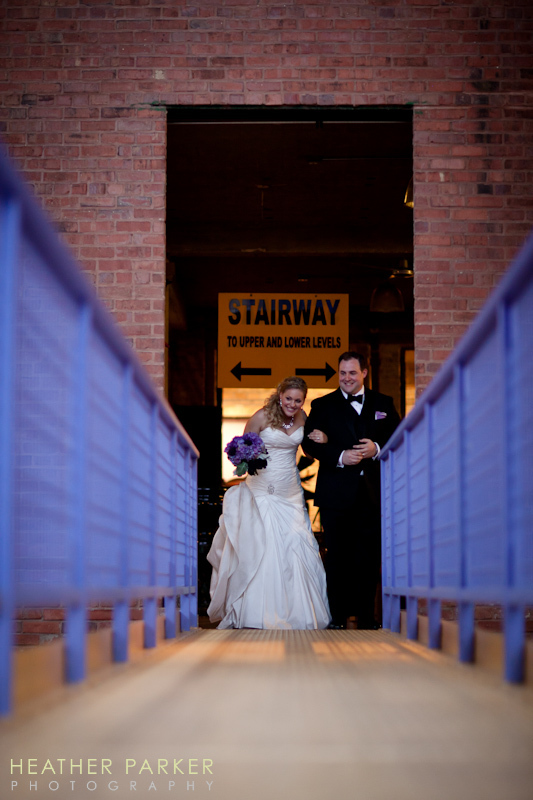 Before the wedding ceremony was set to begin, Tanner and Julia had access to the 80,000 square foot warehouse for some photo opportunities. 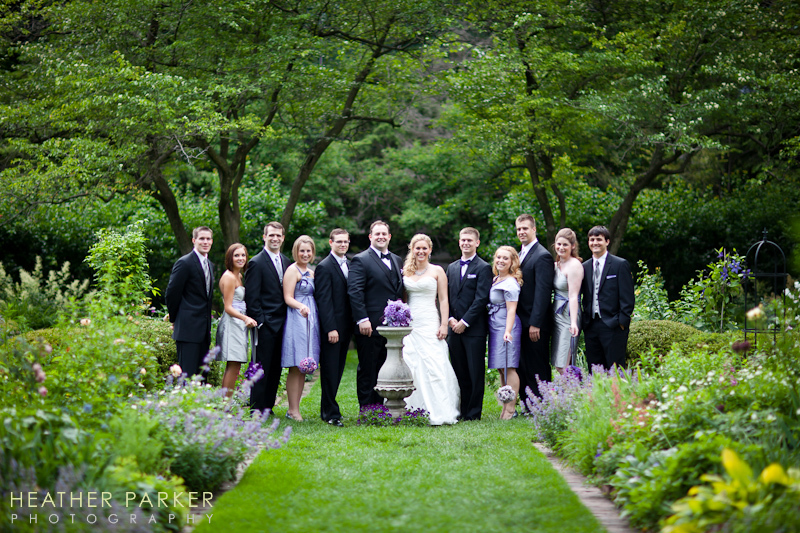 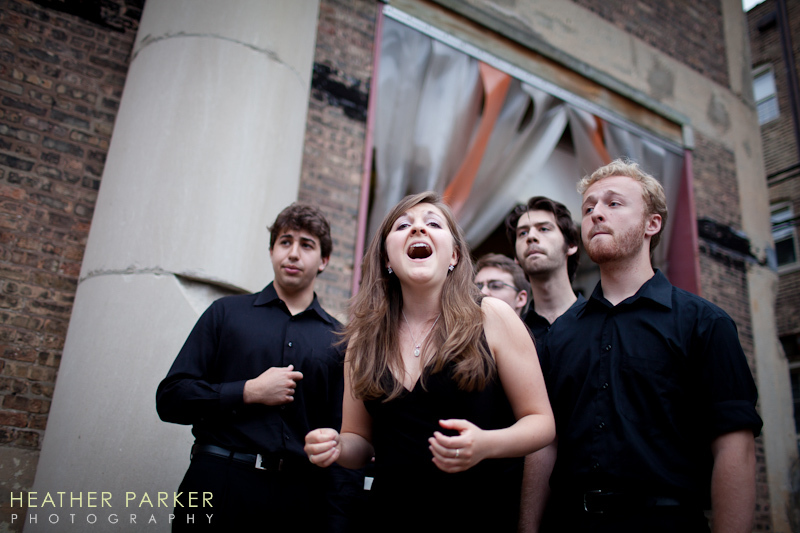 The Northwestern a-capella group led guests from cocktail hour in the atrium to the wedding ceremony location in the courtyard. 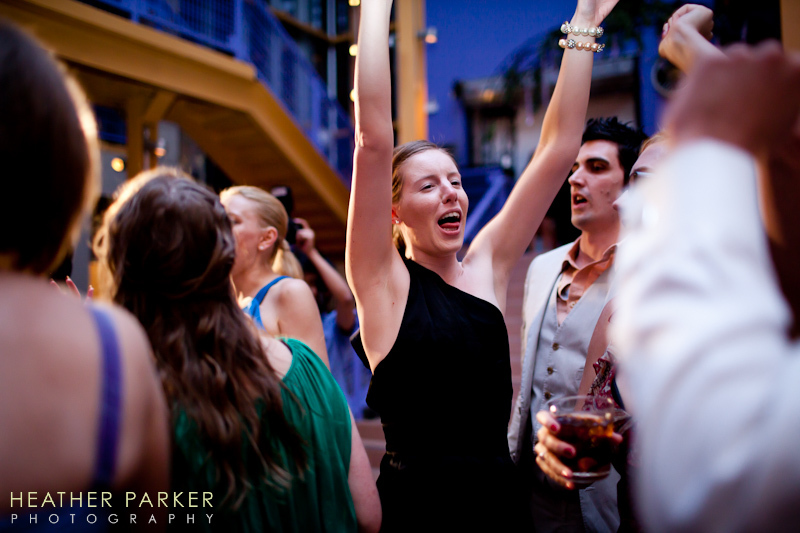 Now keep in mind, we had a scorching hot afternoon on our hands and had just wrapped up cocktail hour. 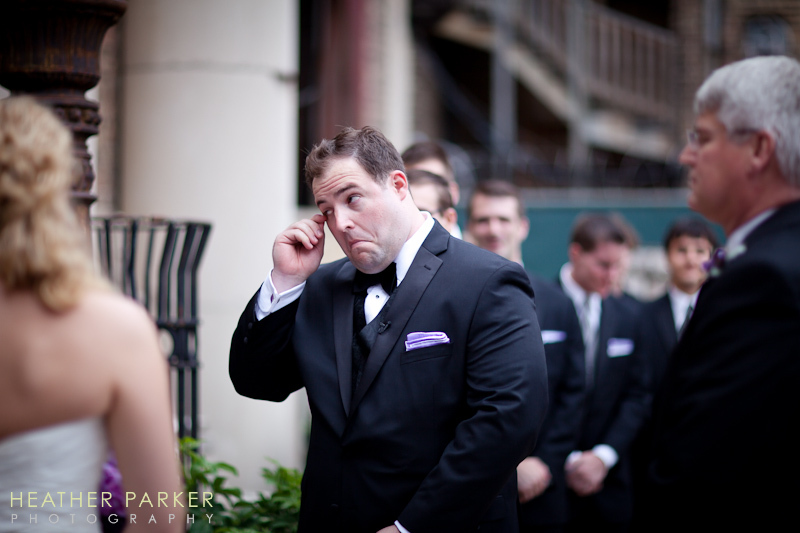 There was already a lot of emotion during the ceremony. 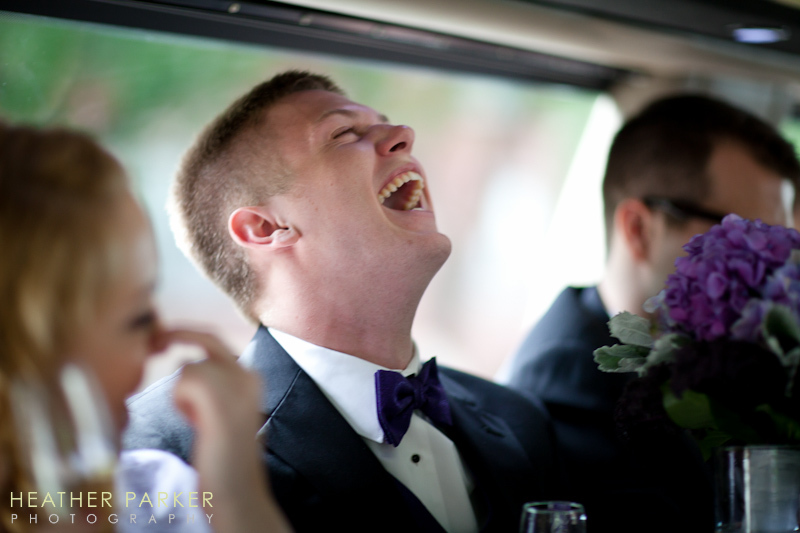 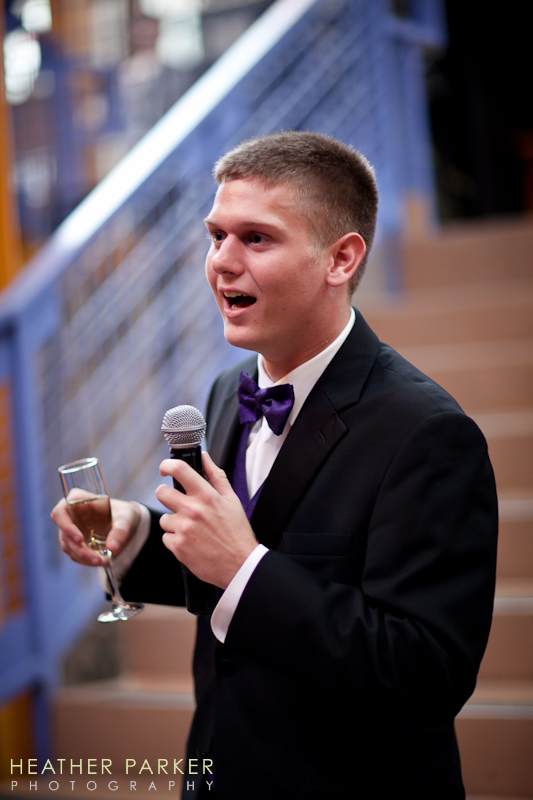 Tanner has already at this point wiped a tear from is eye and laughed…. 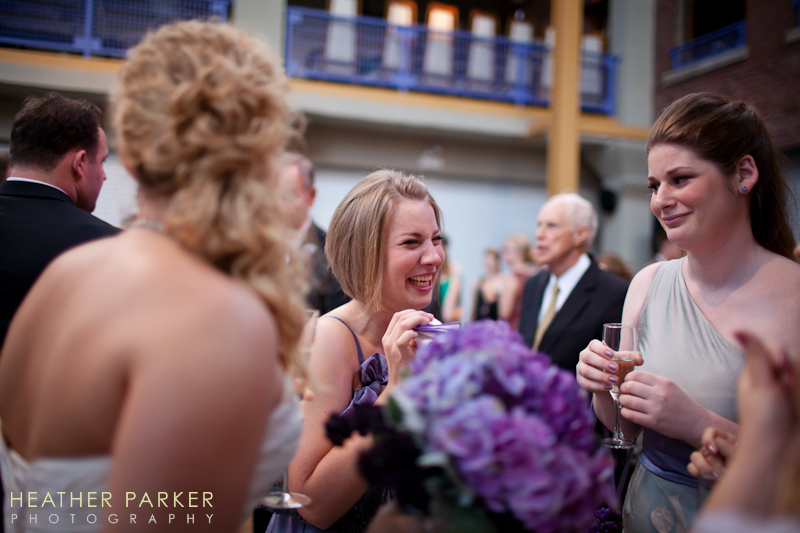 then the unimaginable happened: a bridesmaid fainted. 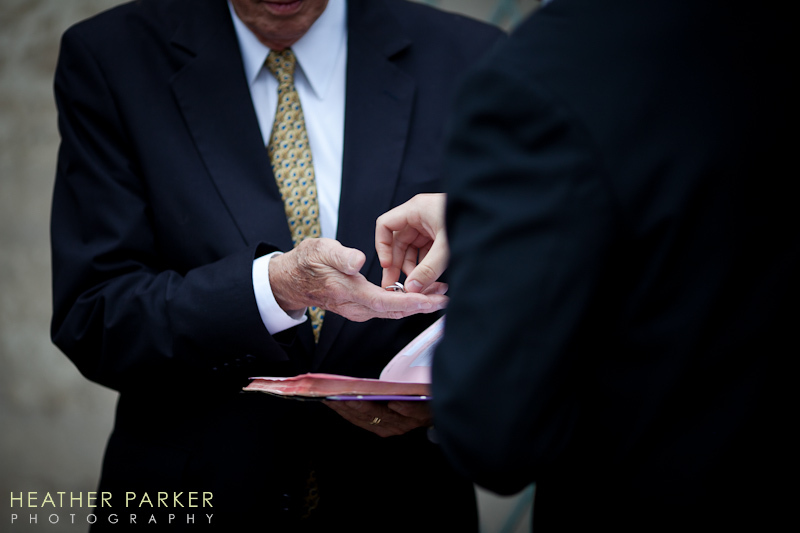 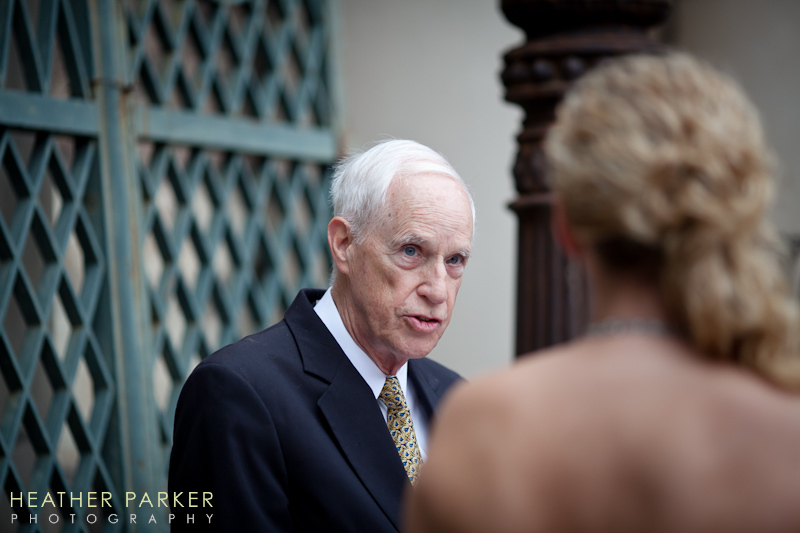 As a wedding photographer that approaches moments as a photojournalist, I briefly hesitated on whether or not I should photograph what was about to happen before my own eyes. 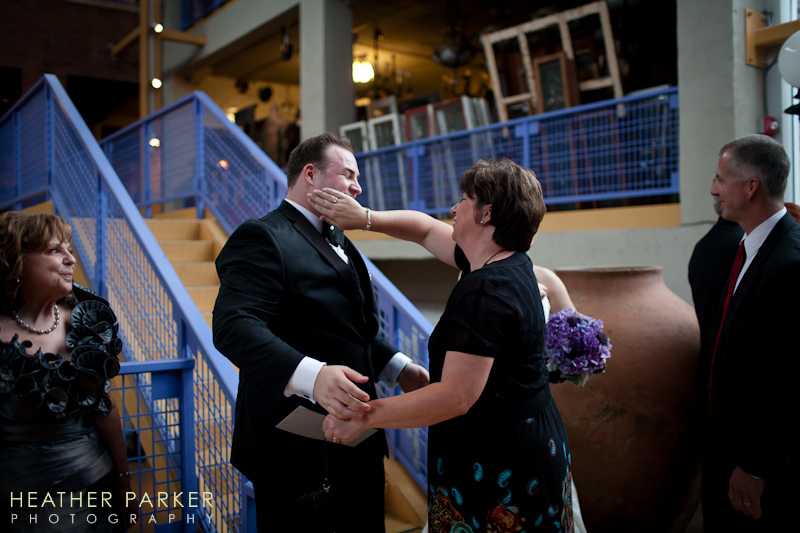 While I am not going to include the sequence of photos I took in this blog post, the moments after the fainting you can see here. 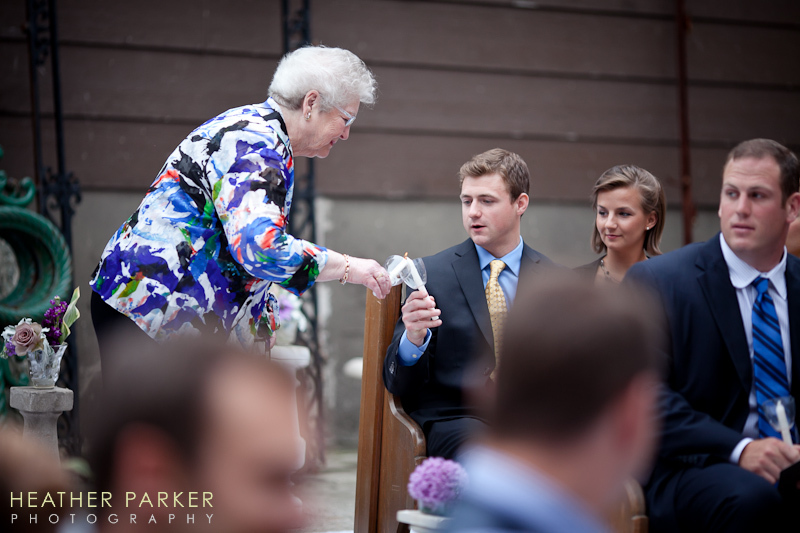 The mother of the bride Beverly stepped right up to make sure this bridesmaid was alright and ensured this close-knit group of friends that the bridesmaid would be okay and the ceremony was go on. 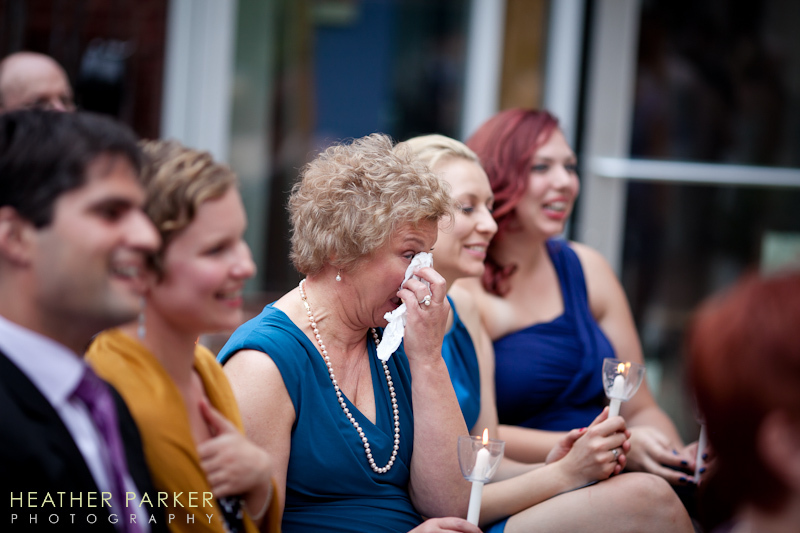 She treated the bridesmaid like her own daughter amidst all the shock (which you can see in the photo below) and bits of laughter. 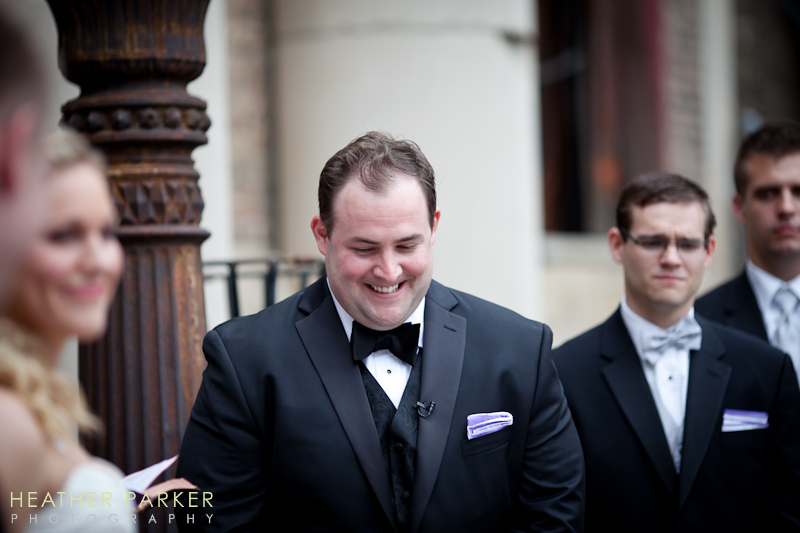 The ceremony continued but the bridesmaids looked over at their friend who took a moment to sit down, with smiles of reassurance. 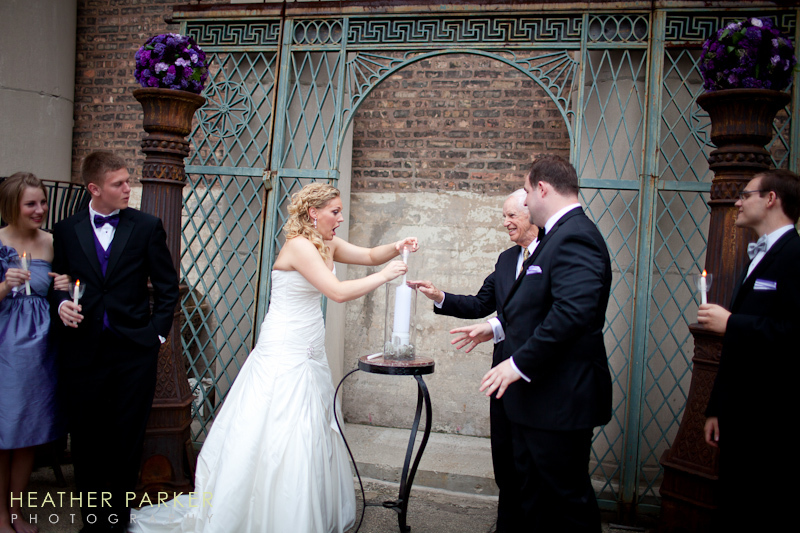 With a parade of candle lighting started by the grand parents, the final candle was the unity candle which Tanner and Julia tried so desperately to light. 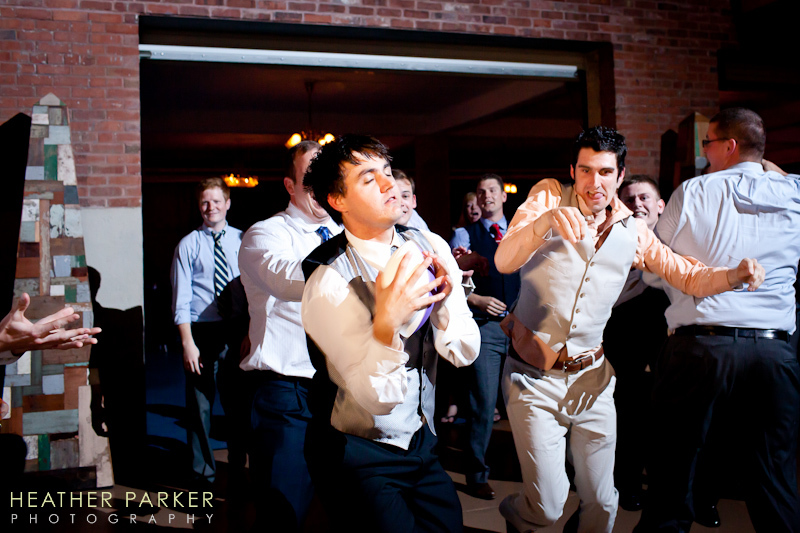 Multiple failed attempts were made and the guests roared with laughter. 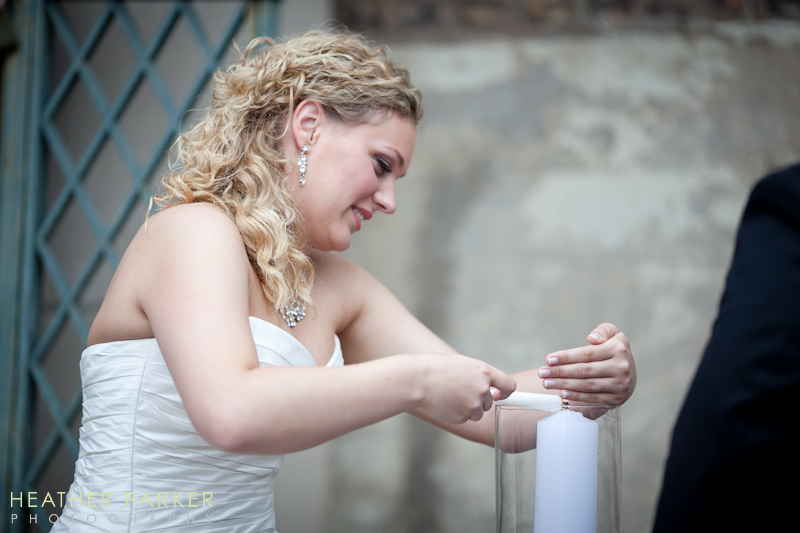 Julia made the decision that she was going to use a smaller candle if that’s what it was going to take to display a flame of unity during their wedding ceremony. 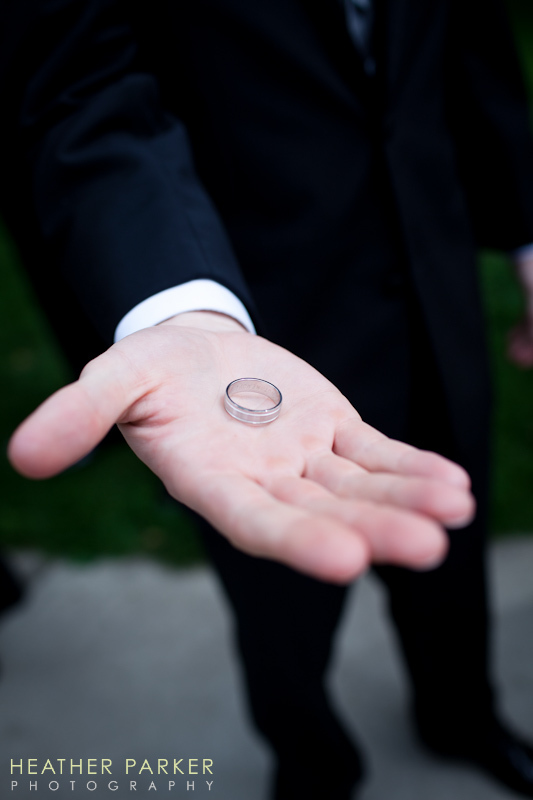 After an exchange of rings and vows, the recessional began with a “Mazel Tov!” as something shattered. 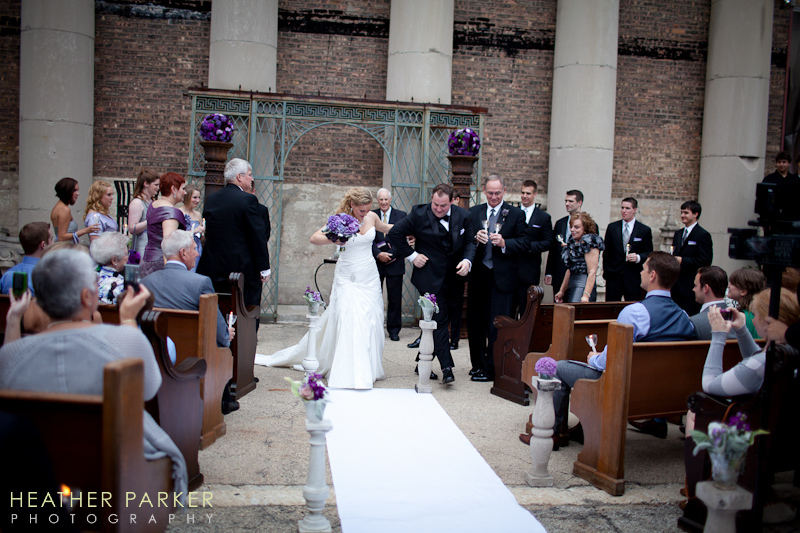 While this ceremony had some minor hiccups, it is probably going to go down as one of the most memorable ones. 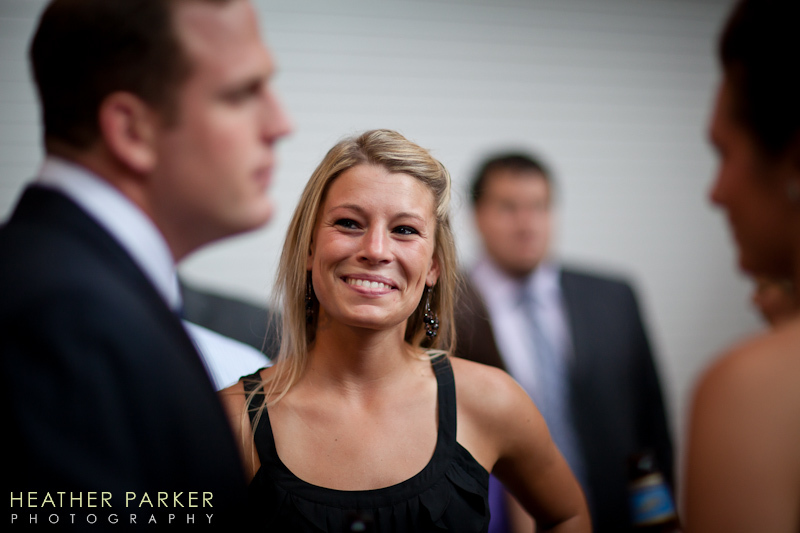 Did Tanner know what he was going to receive during the receiving line? 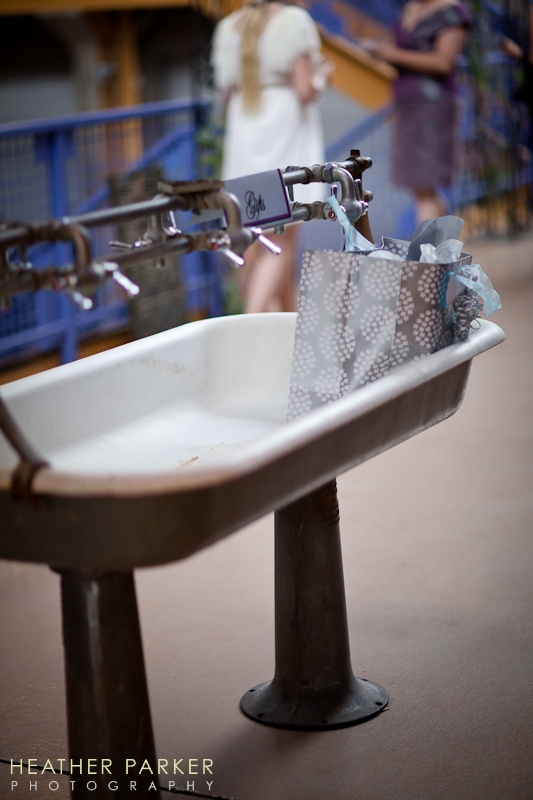 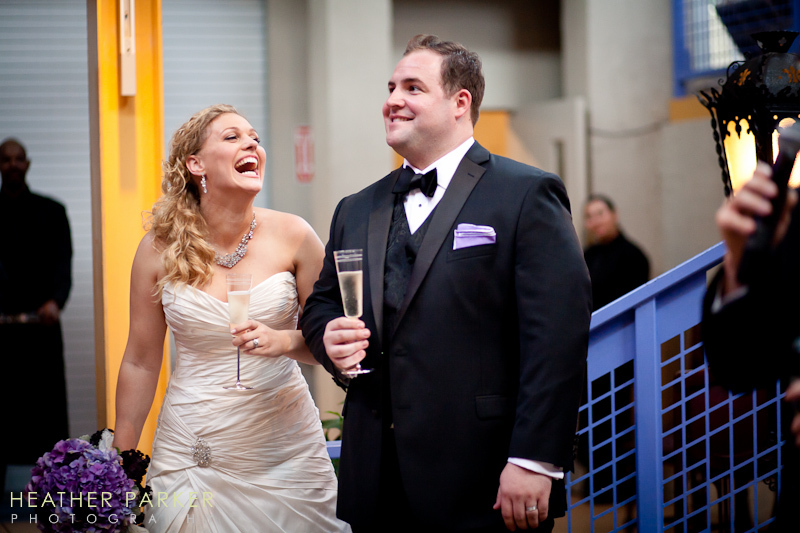 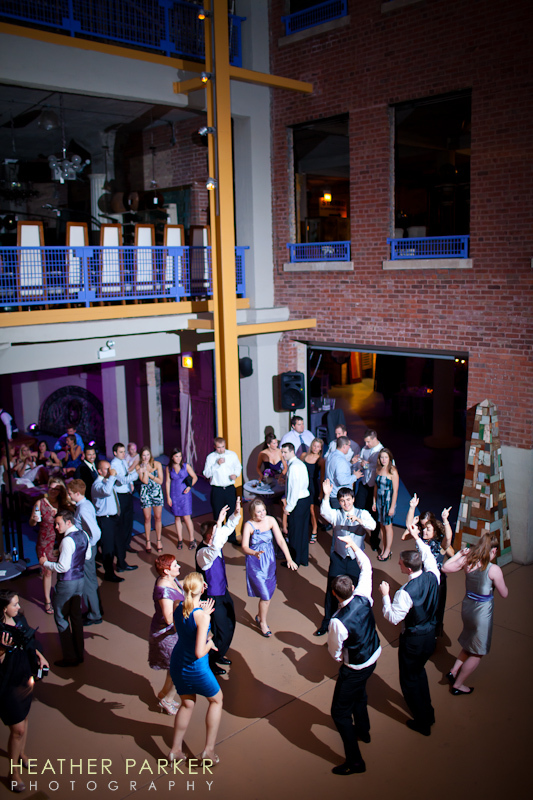 After mingling and more laughter in the atrium, guests headed into the reception for cake cutting, dinner, and dancing. 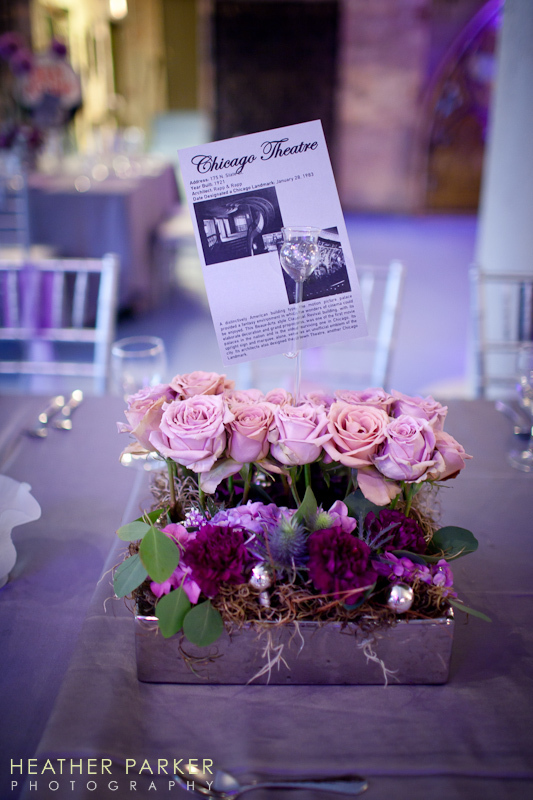 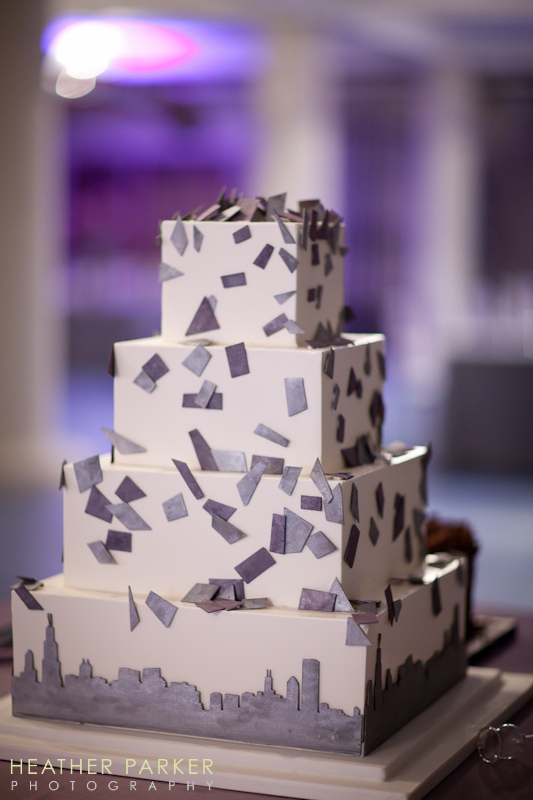 Since this was a destination wedding for both of their families, elements of Chicago were tied into the decor including a skyline on the cake. 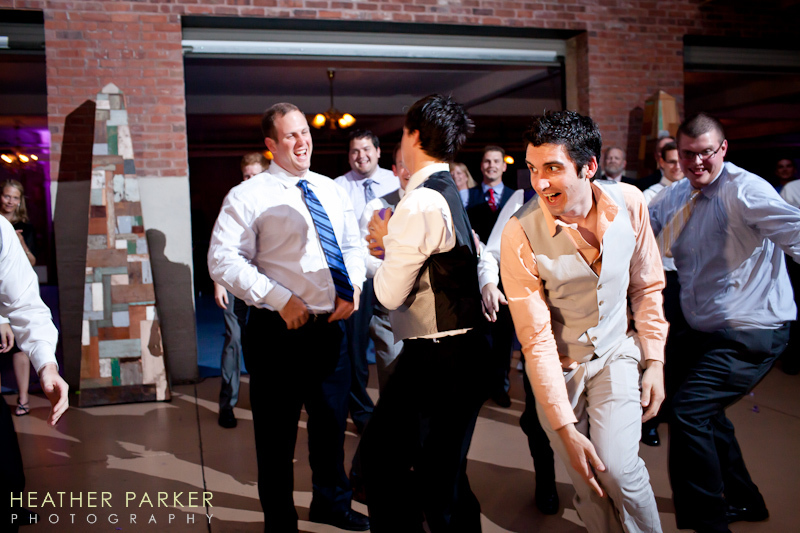 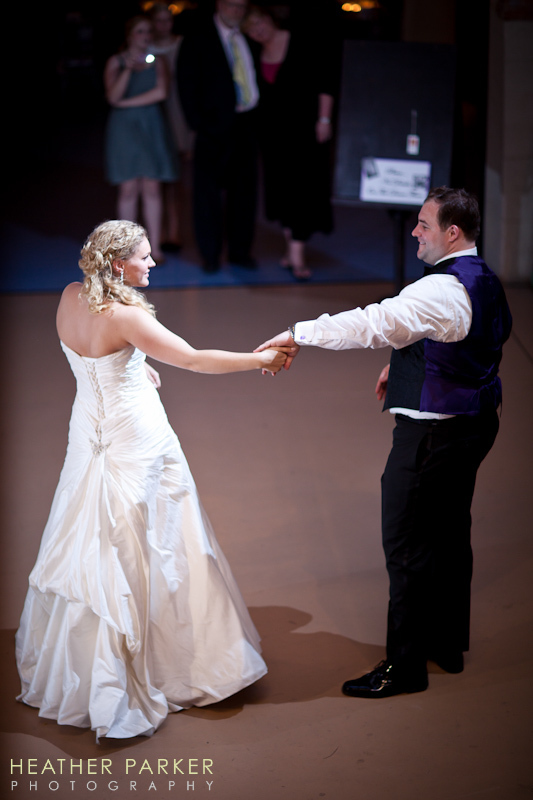 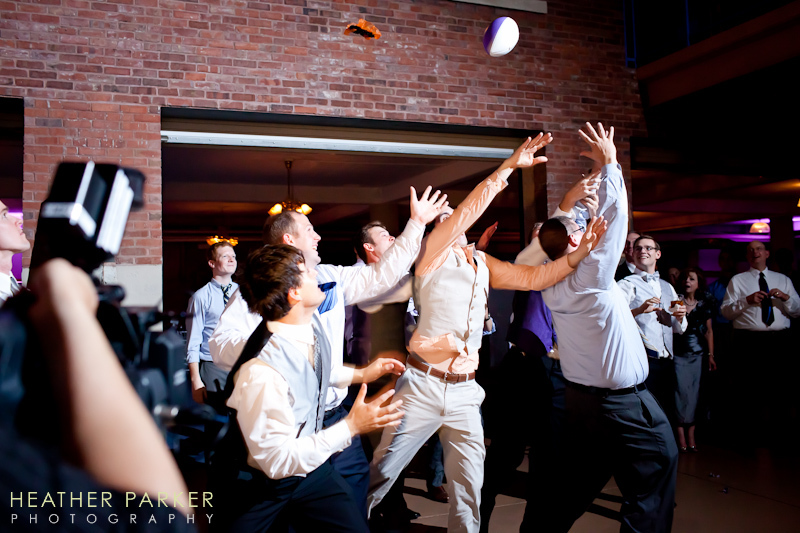 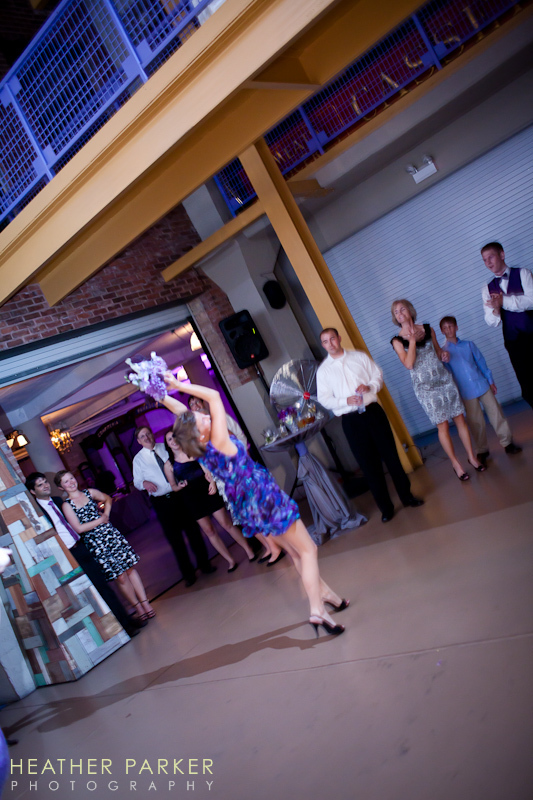 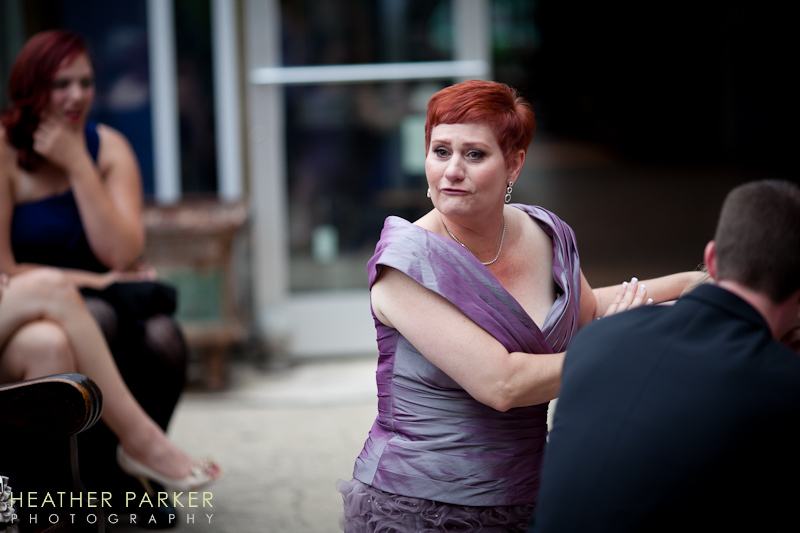 After the bouquet toss, the garter toss was supplemented with a football toss. 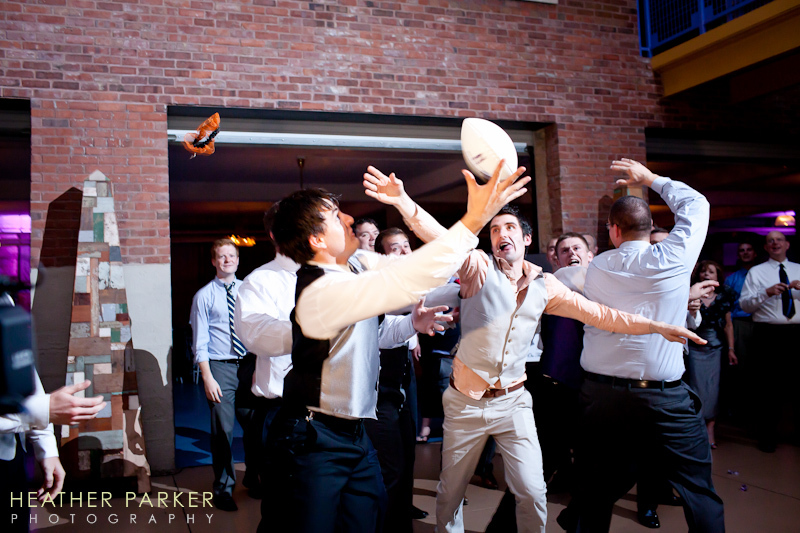 The next few shots so the sequence of the action. 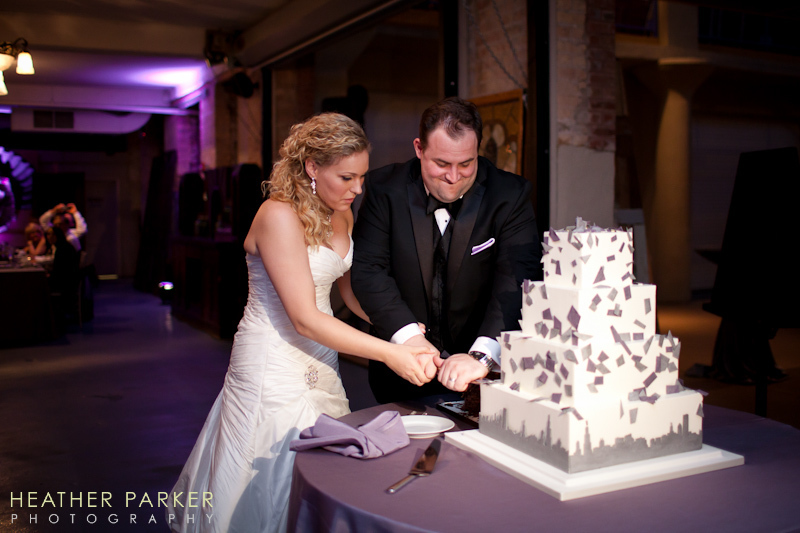 The second from this Architectural Artifacts wedding photo was featured on Moment Junkie, a blog that highlights split-second moments captured with a true photojournalistic approach. 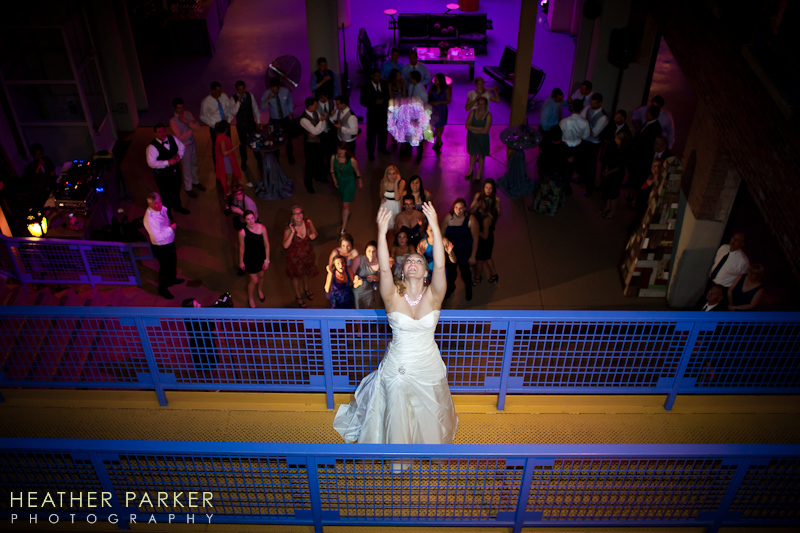 I took this photo so you could see how very cool this warehouse wedding venue is. 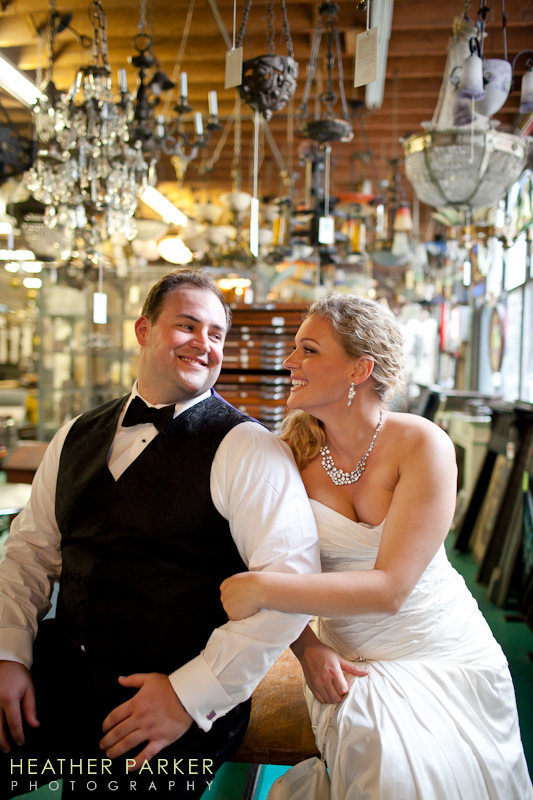 The atrium at Architectural Artifacts is covered is surrounded by several floors of antiques. 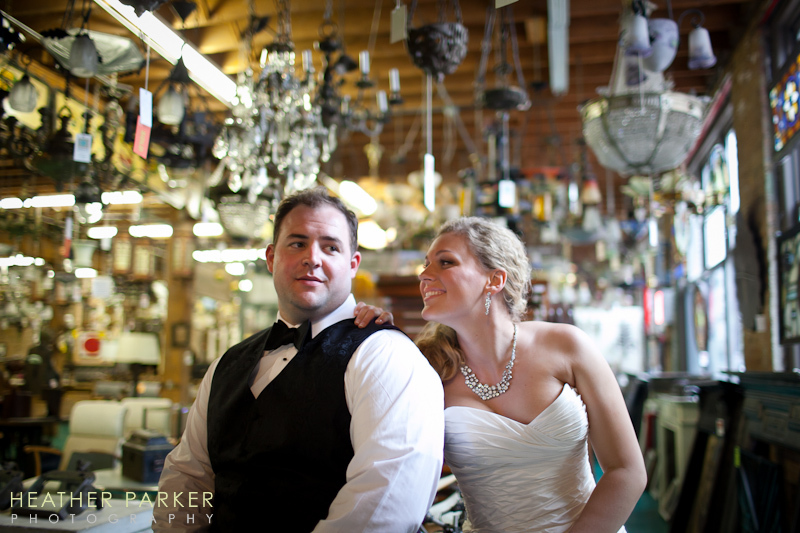 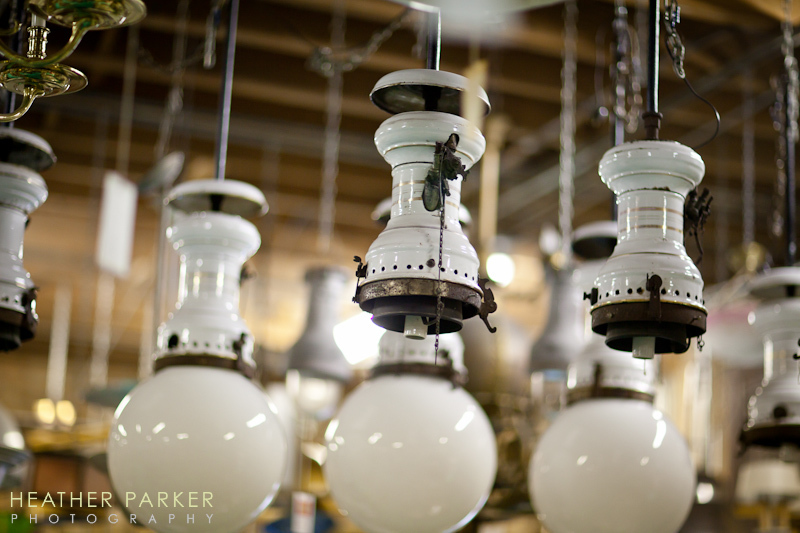 During the day this loft space functions as a real antique store. 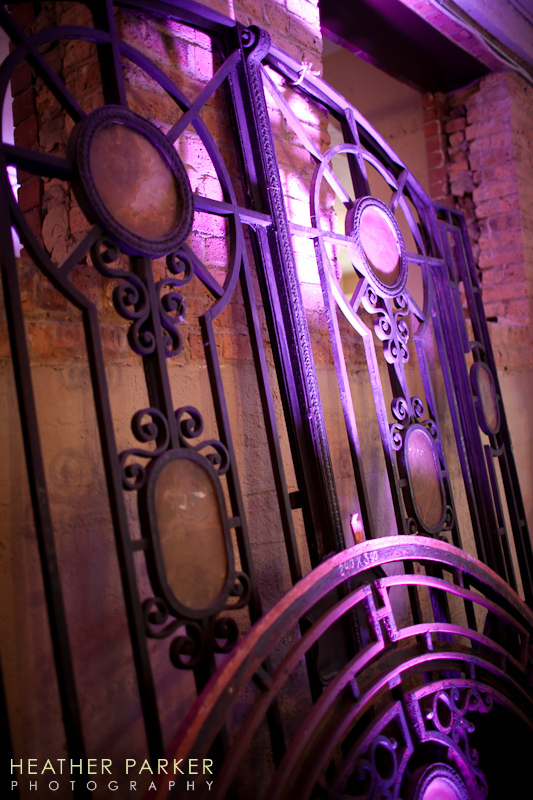 Below you can check out a few more photos of the perfect style created by Flora with lighting design by Allure Designs. 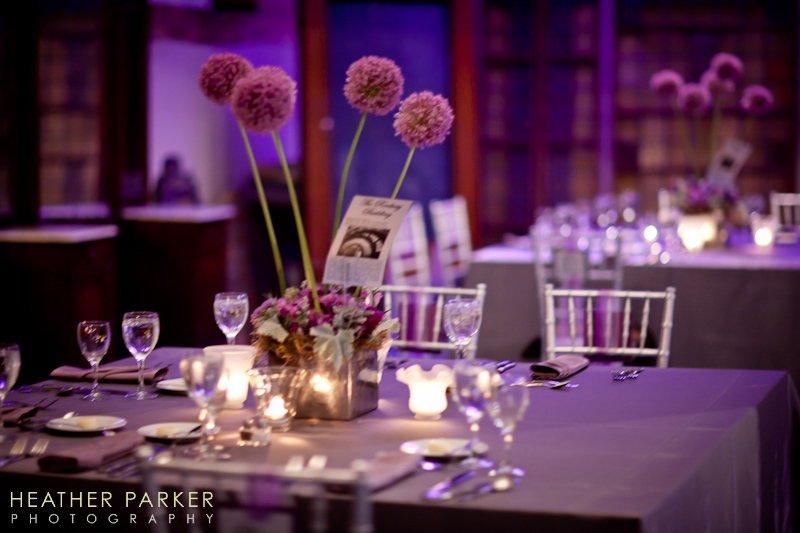 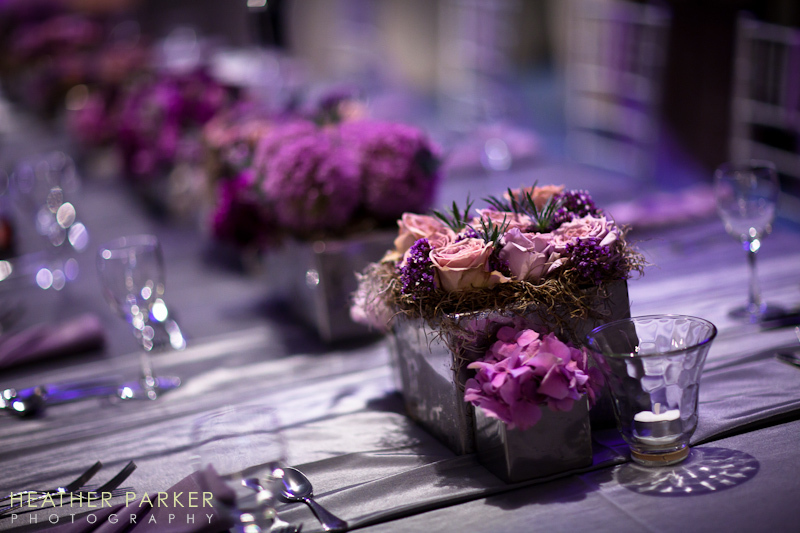 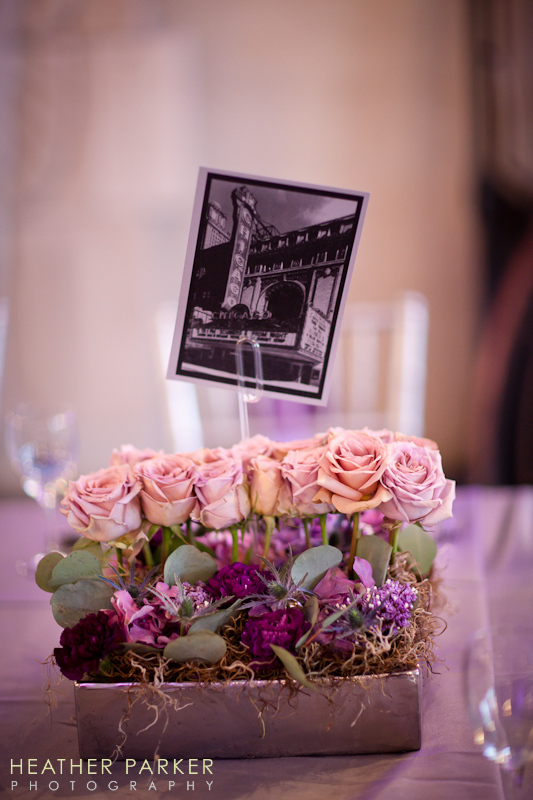 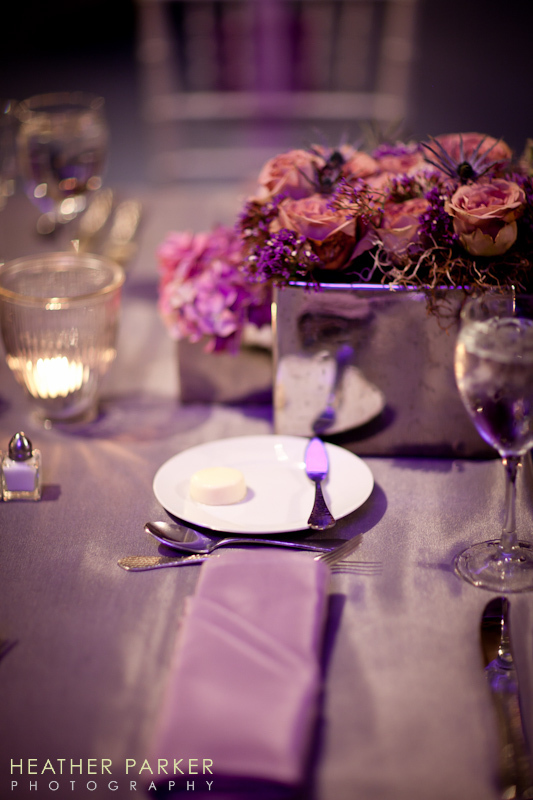 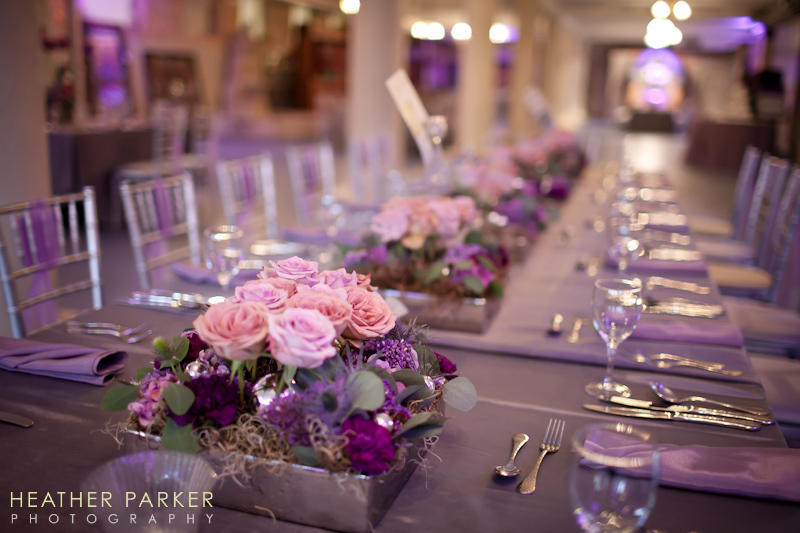 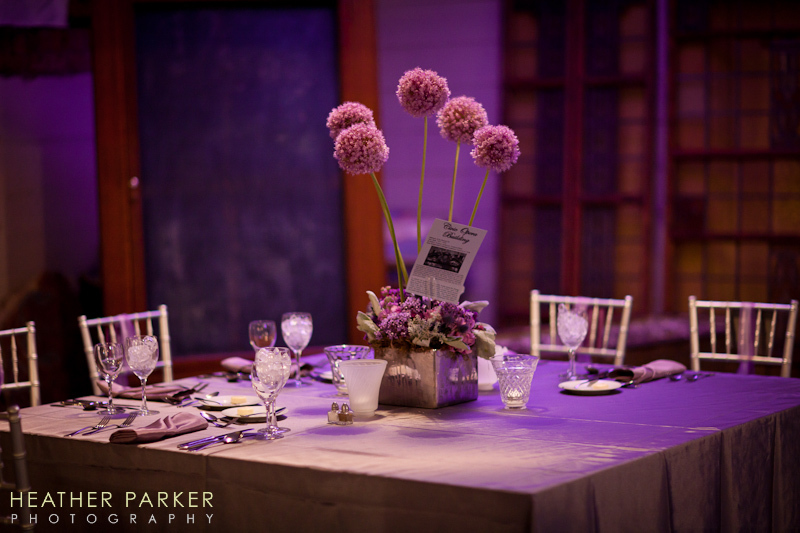 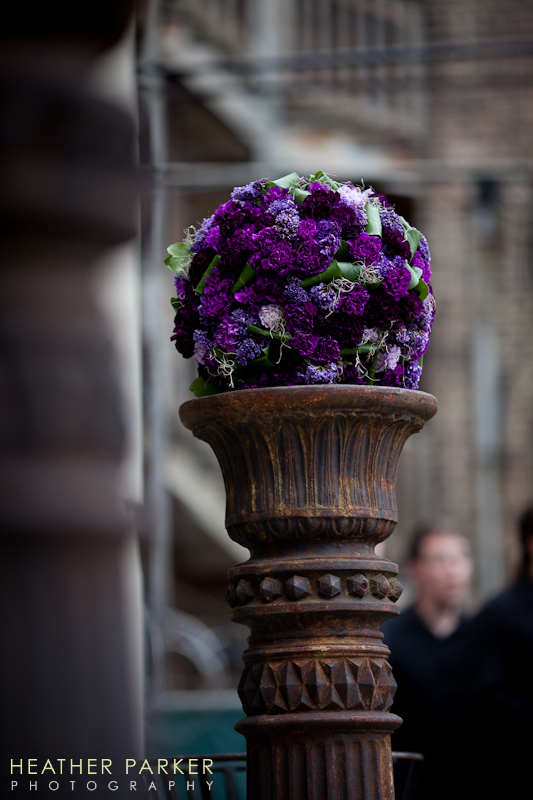 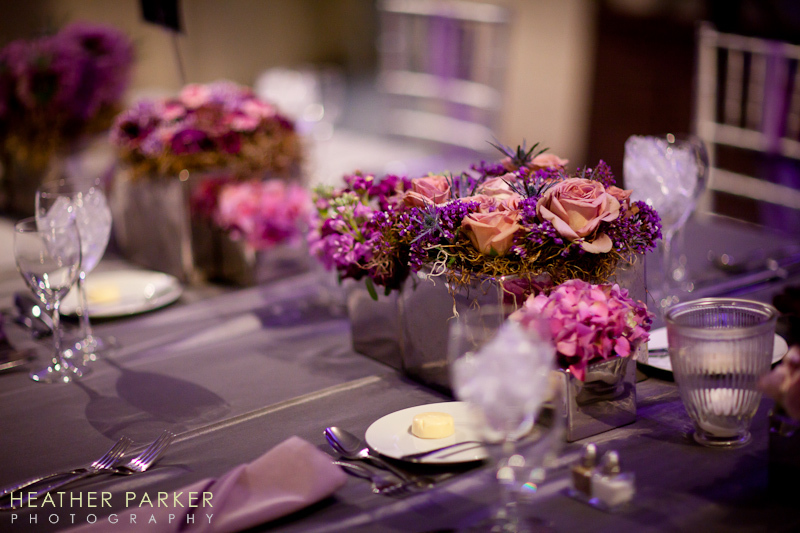 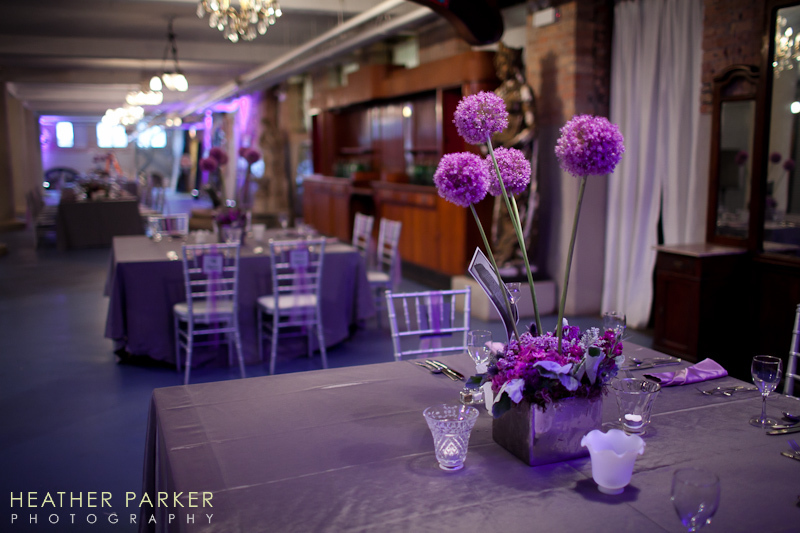 Pomander style accents for the centerpieces added a modern element to a wedding at an antiques warehouse space. 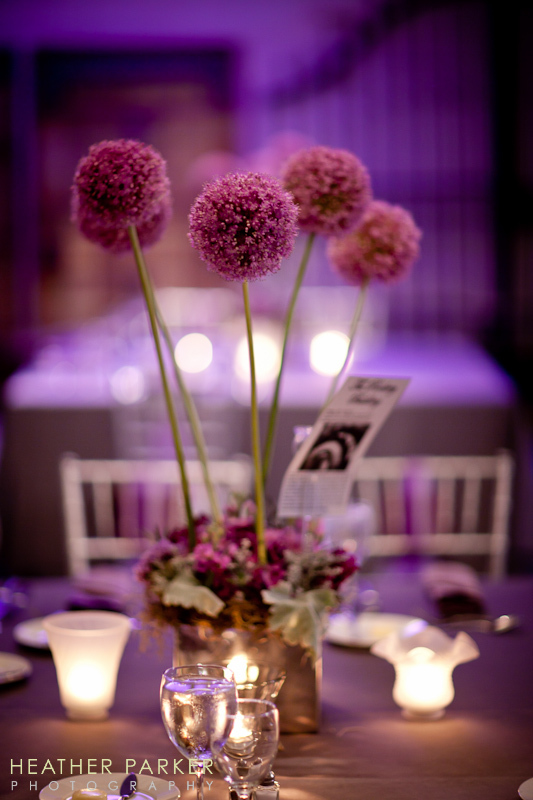 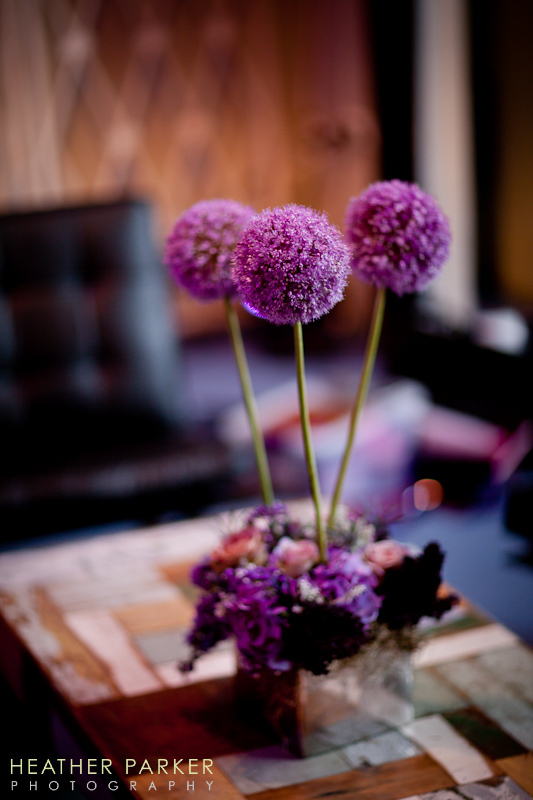 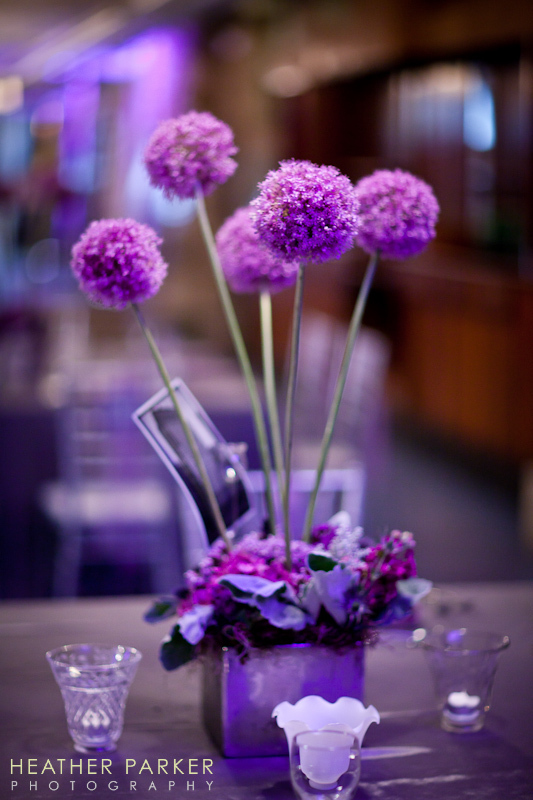 These wonderful modern purple flowers are called allium, and are part of the onion plant group believe it or not!